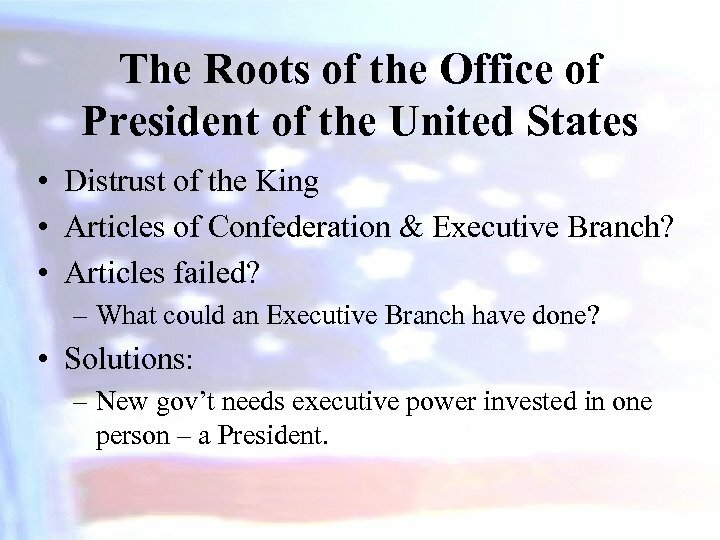 The Roots of the Office of President of the United States • Distrust of the King • Articles of Confederation & Executive Branch? • Articles failed? 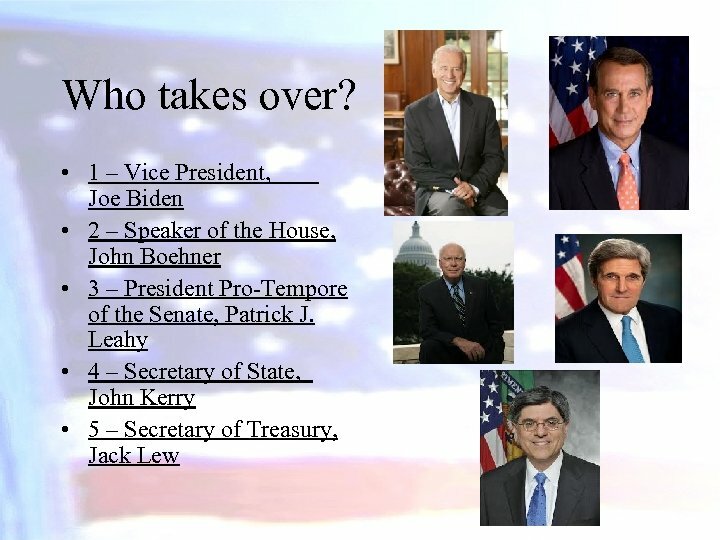 – What could an Executive Branch have done? 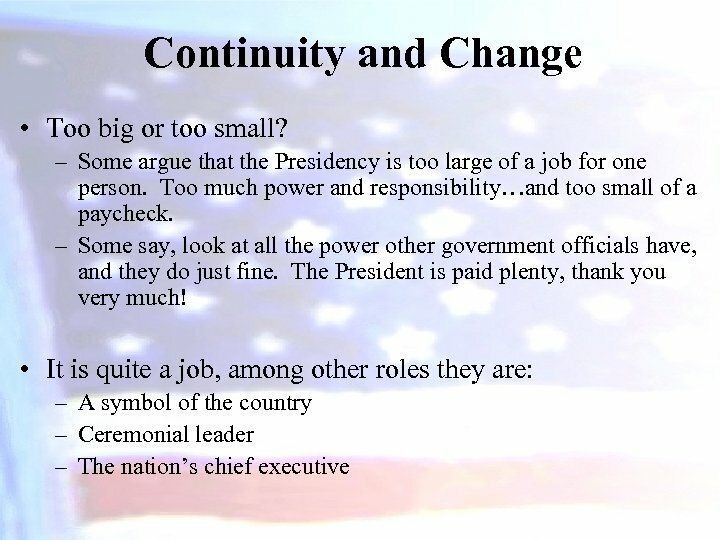 • Solutions: – New gov’t needs executive power invested in one person – a President. 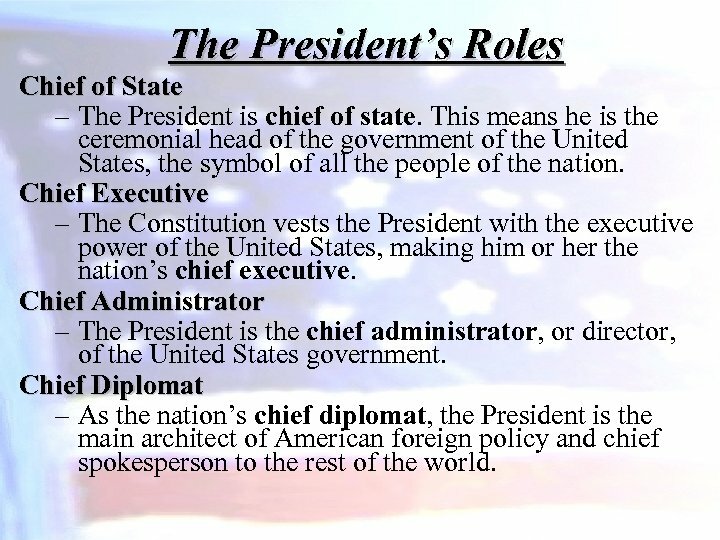 The President’s Roles Chief of State – The President is chief of state. This means he is the ceremonial head of the government of the United States, the symbol of all the people of the nation. 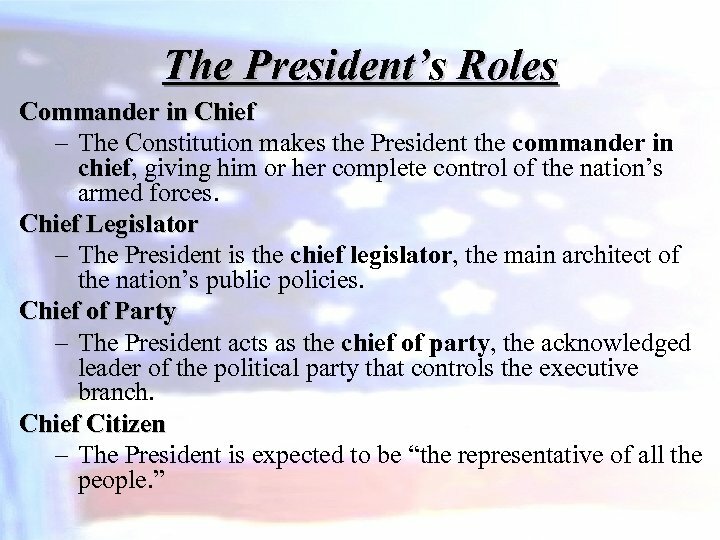 Chief Executive – The Constitution vests the President with the executive power of the United States, making him or her the nation’s chief executive. 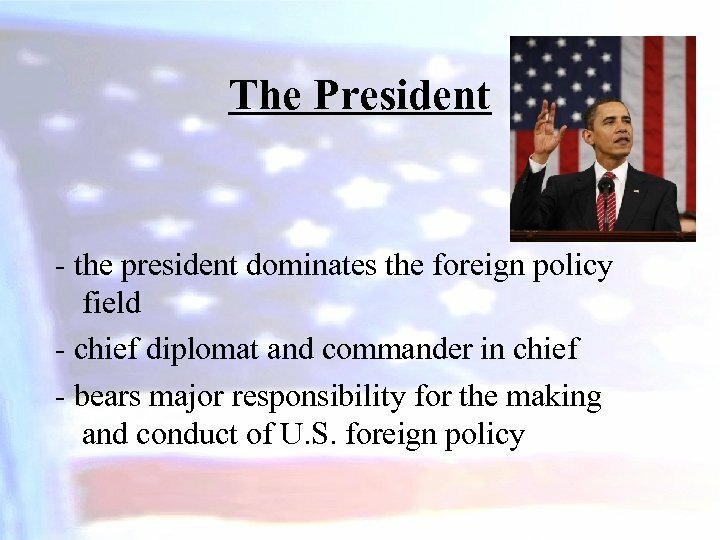 Chief Administrator – The President is the chief administrator, or director, of the United States government. 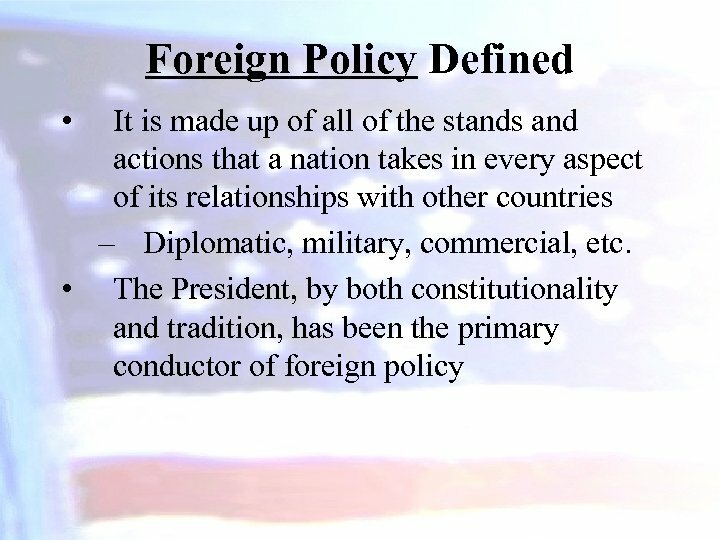 Chief Diplomat – As the nation’s chief diplomat, the President is the main architect of American foreign policy and chief spokesperson to the rest of the world. 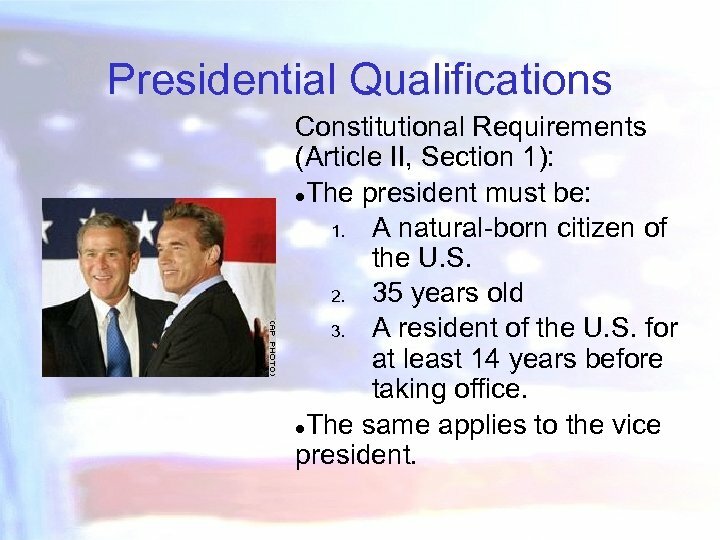 Presidential Qualifications Constitutional Requirements (Article II, Section 1): ●The president must be: 1. A natural-born citizen of the U. S. 2. 35 years old 3. A resident of the U. S. for at least 14 years before taking office. ●The same applies to the vice president. 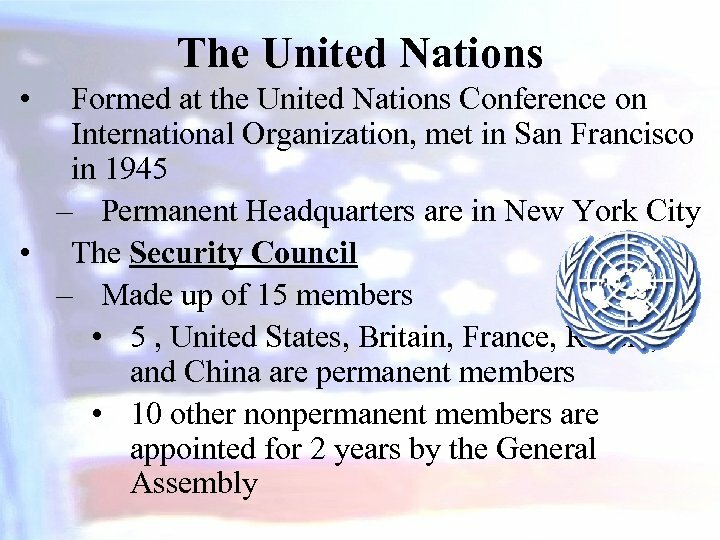 Terms of Office – Controversial! 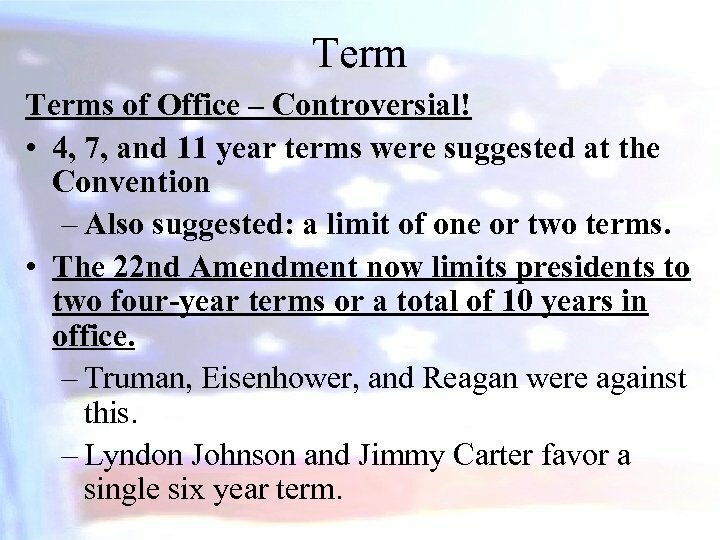 • 4, 7, and 11 year terms were suggested at the Convention – Also suggested: a limit of one or two terms. 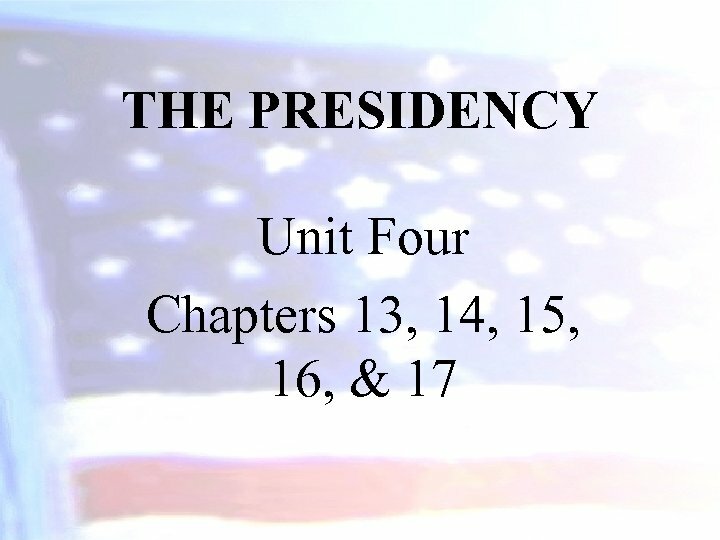 • The 22 nd Amendment now limits presidents to two four-year terms or a total of 10 years in office. 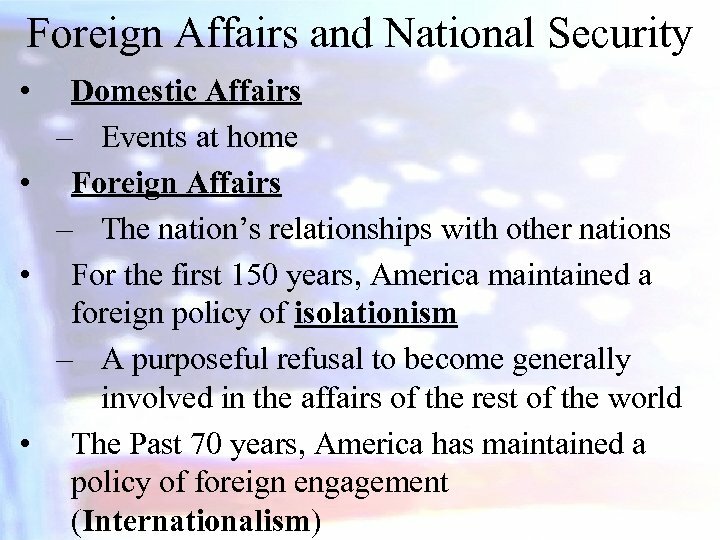 – Truman, Eisenhower, and Reagan were against this. 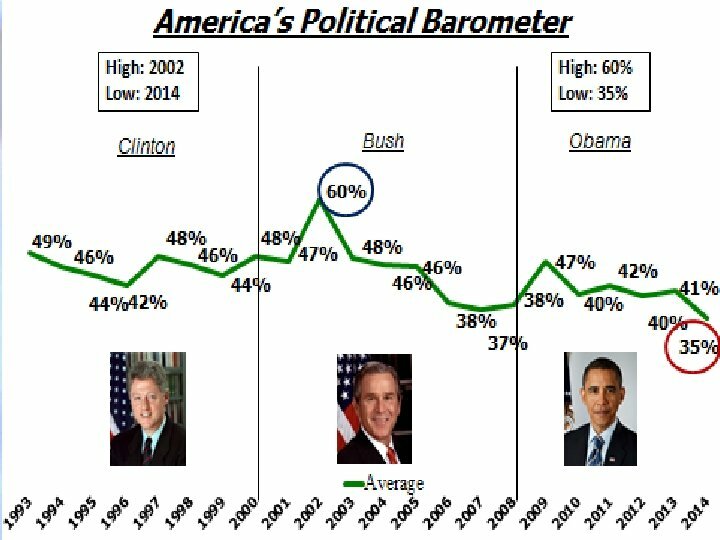 – Lyndon Johnson and Jimmy Carter favor a single six year term. Pay and Benefits • President – Receive about $450, 000 per year. 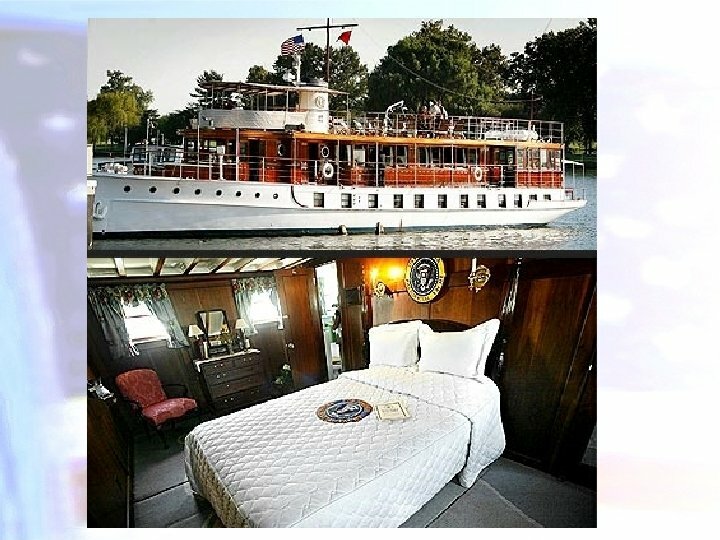 • $400, 000/year, and $50, 000 for expenses – Also get fringe benefits: • Use of White House, Camp David, cars, airplanes, yacht – Congress fixes this amount. • Ex-President – They all receive a lifetime pension of $148, 400. 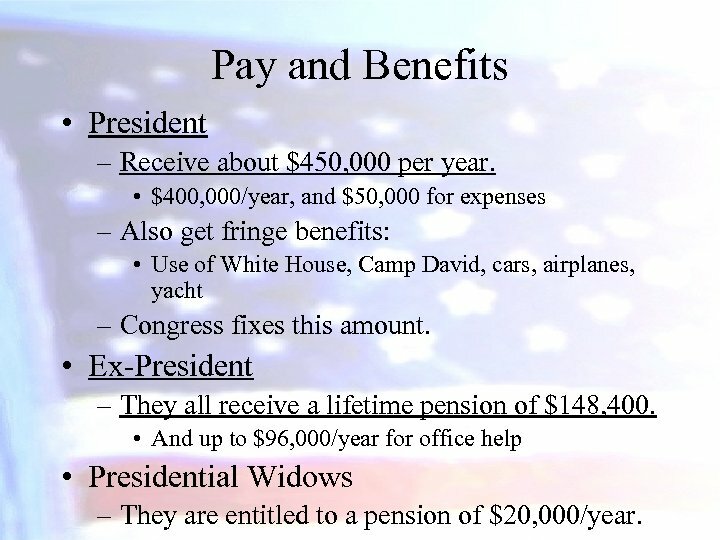 • And up to $96, 000/year for office help • Presidential Widows – They are entitled to a pension of $20, 000/year. 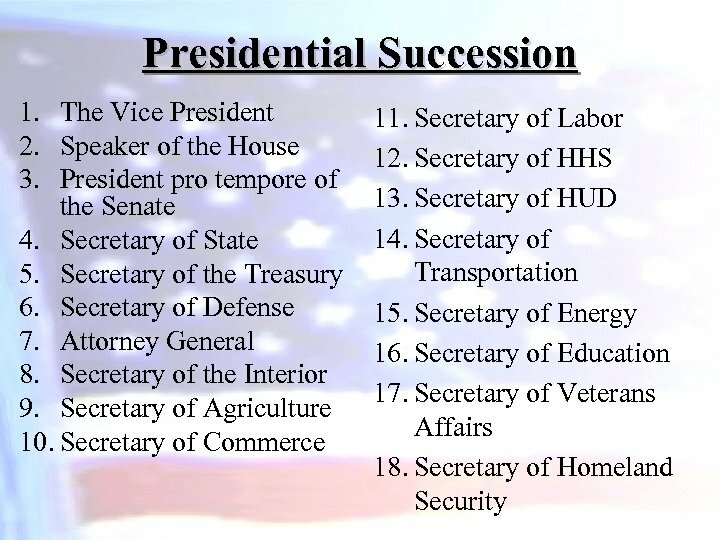 Succession • As of today, 8 vacancies for the President have occurred: – 7 presidents have died, plus Nixon on resignation. 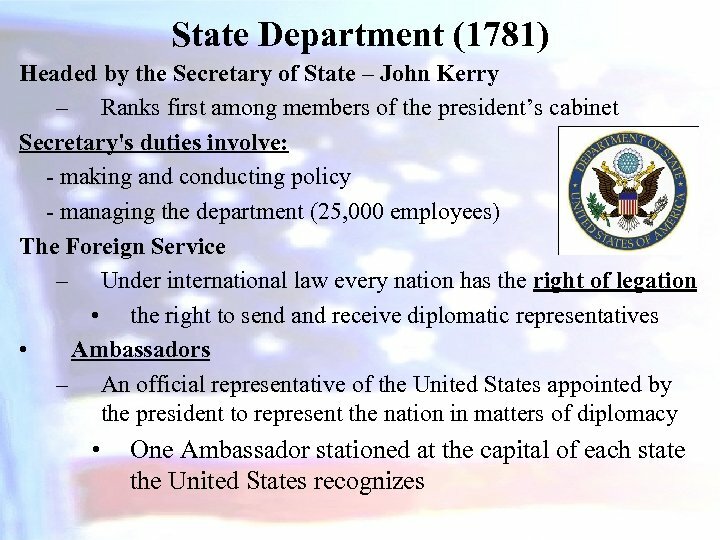 • If the President is unable to perform his duties the vice president then becomes responsible for the office. 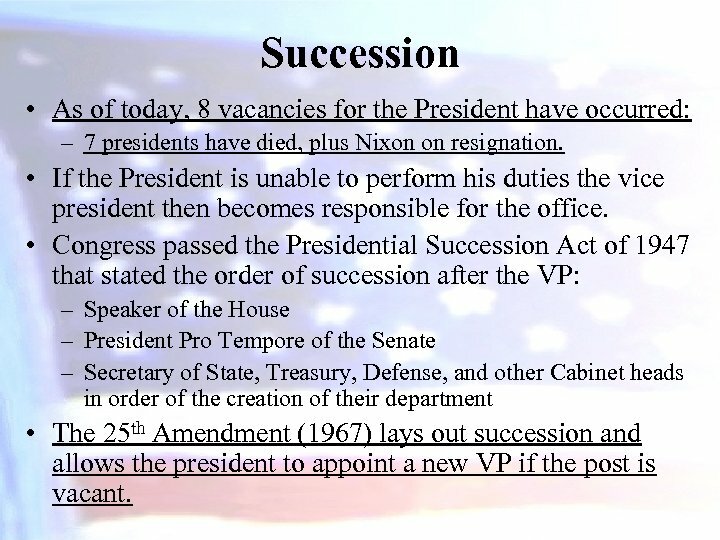 • Congress passed the Presidential Succession Act of 1947 that stated the order of succession after the VP: – Speaker of the House – President Pro Tempore of the Senate – Secretary of State, Treasury, Defense, and other Cabinet heads in order of the creation of their department • The 25 th Amendment (1967) lays out succession and allows the president to appoint a new VP if the post is vacant. 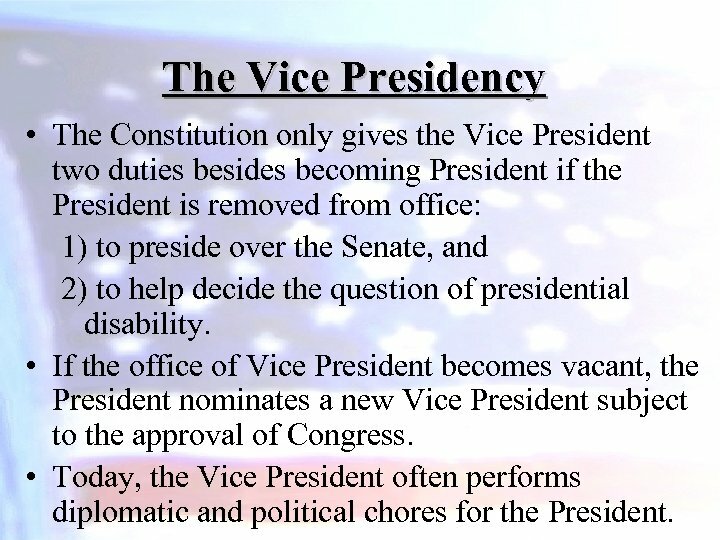 The Vice Presidency • The Constitution only gives the Vice President two duties besides becoming President if the President is removed from office: 1) to preside over the Senate, and 2) to help decide the question of presidential disability. • If the office of Vice President becomes vacant, the President nominates a new Vice President subject to the approval of Congress. • Today, the Vice President often performs diplomatic and political chores for the President. The Vice President • “I am the Vice President. In this I am nothing, but I may be everything. ” - John Adams • “The Vice Presidency isn’t worth a warm pitcher of spit. ” - John Garner (VP to FDR) • The office has little power & VPs have low profiles. 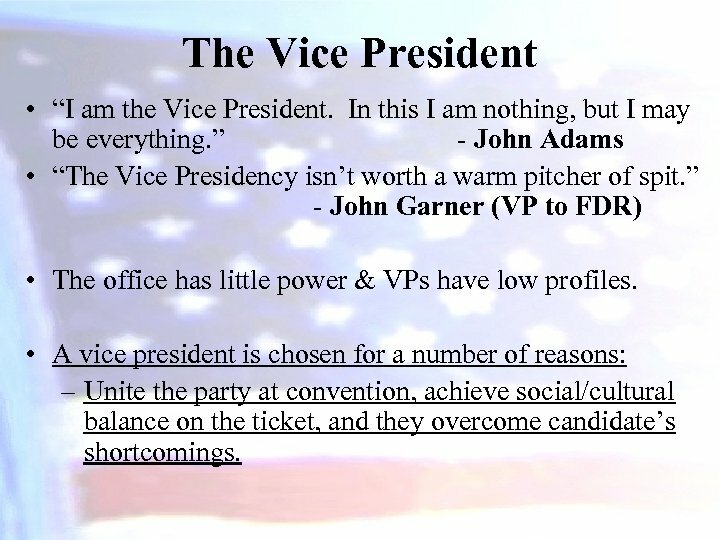 • A vice president is chosen for a number of reasons: – Unite the party at convention, achieve social/cultural balance on the ticket, and they overcome candidate’s shortcomings. What merits…incapacitation? • They never really described how a President becomes disabled. – They have all had strokes, heart attacks, bullets. • VP will become Acting President if… – 1. ) The President tells Congress in writing that he can’t do his job. – 2. ) 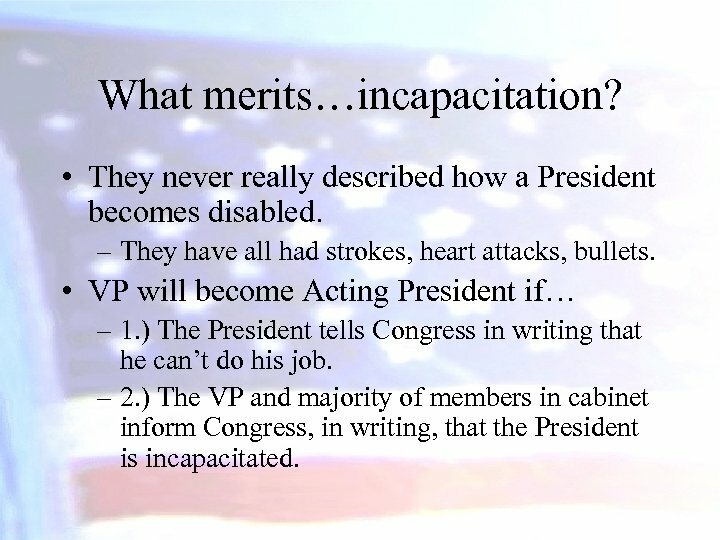 The VP and majority of members in cabinet inform Congress, in writing, that the President is incapacitated. 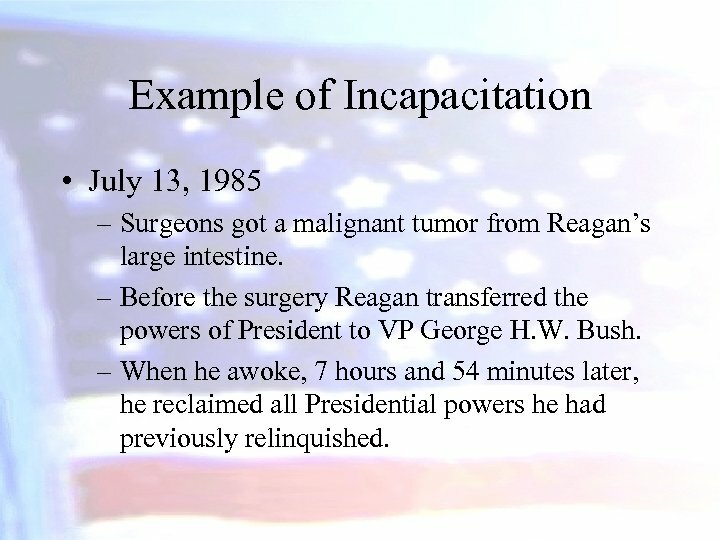 Example of Incapacitation • July 13, 1985 – Surgeons got a malignant tumor from Reagan’s large intestine. – Before the surgery Reagan transferred the powers of President to VP George H. W. Bush. 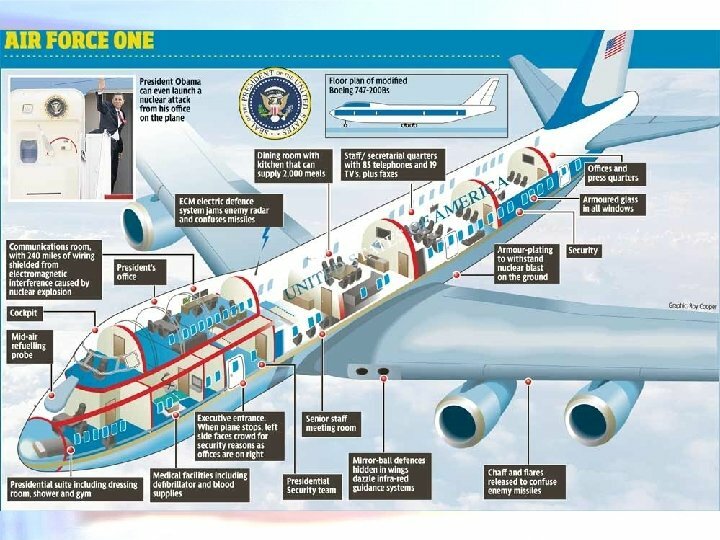 – When he awoke, 7 hours and 54 minutes later, he reclaimed all Presidential powers he had previously relinquished. 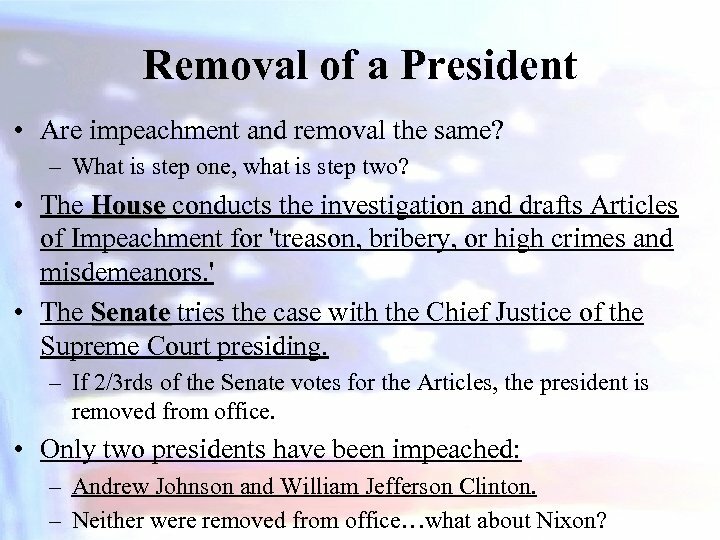 Removal of a President • Are impeachment and removal the same? – What is step one, what is step two? • The House conducts the investigation and drafts Articles House of Impeachment for 'treason, bribery, or high crimes and misdemeanors. ' • The Senate tries the case with the Chief Justice of the Senate Supreme Court presiding. – If 2/3 rds of the Senate votes for the Articles, the president is removed from office. 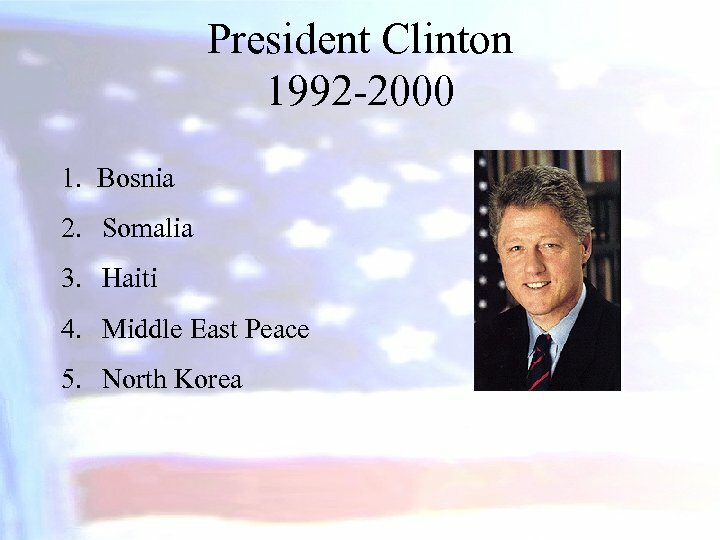 • Only two presidents have been impeached: – Andrew Johnson and William Jefferson Clinton. – Neither were removed from office…what about Nixon? 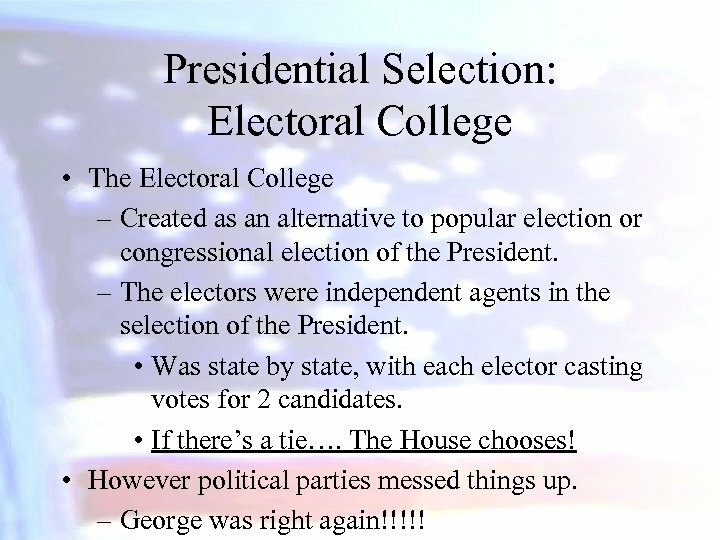 Presidential Selection: Electoral College • The Electoral College – Created as an alternative to popular election or congressional election of the President. – The electors were independent agents in the selection of the President. • Was state by state, with each elector casting votes for 2 candidates. • If there’s a tie…. The House chooses! • However political parties messed things up. – George was right again!!!!! 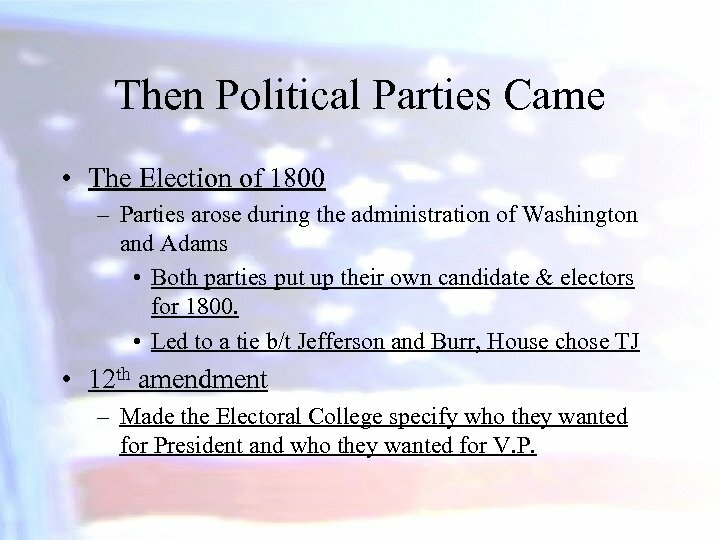 Then Political Parties Came • The Election of 1800 – Parties arose during the administration of Washington and Adams • Both parties put up their own candidate & electors for 1800. • Led to a tie b/t Jefferson and Burr, House chose TJ • 12 th amendment – Made the Electoral College specify who they wanted for President and who they wanted for V. P.
Electoral College Today Voters do not vote directly for the President. 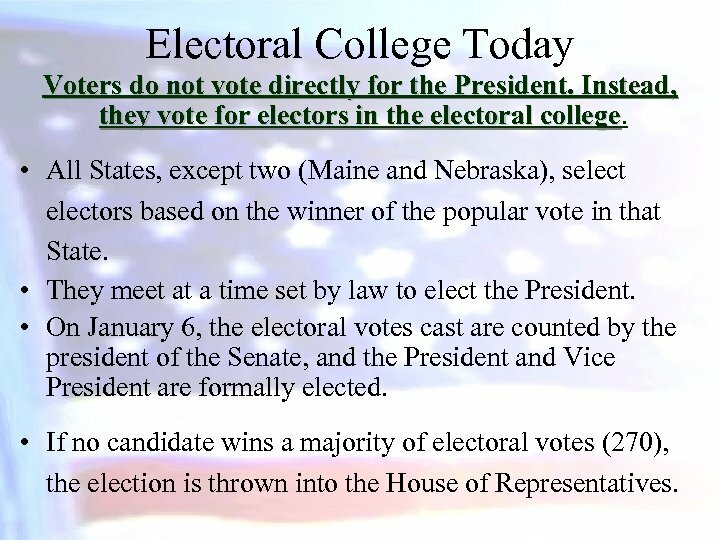 Instead, they vote for electors in the electoral college • All States, except two (Maine and Nebraska), selectors based on the winner of the popular vote in that State. • They meet at a time set by law to elect the President. • On January 6, the electoral votes cast are counted by the president of the Senate, and the President and Vice President are formally elected. • If no candidate wins a majority of electoral votes (270), the election is thrown into the House of Representatives. But there are problems… 1. 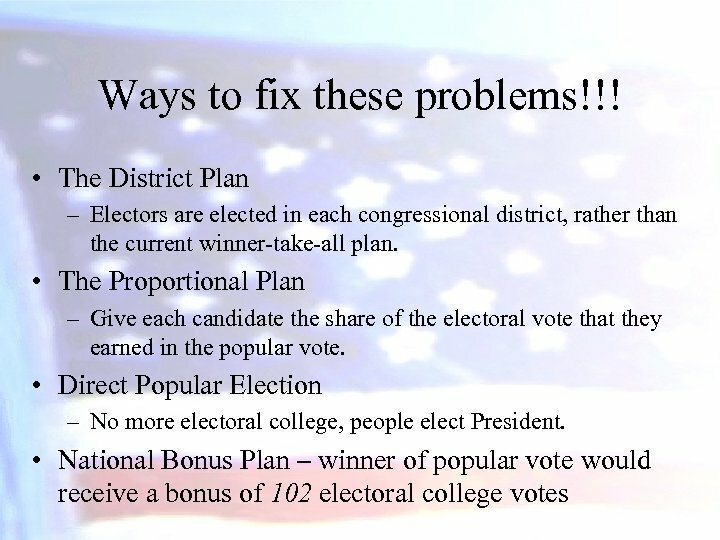 Electoral votes are not distributed in exact proportion to the population – The winner of the popular vote may not win the electoral vote This happened four times in U. S. history (1824, 1876, 1888, and 2000). 2000 2. Electors aren’t bound by the Constitution to vote for the candidate favored by the people of the State. 3. 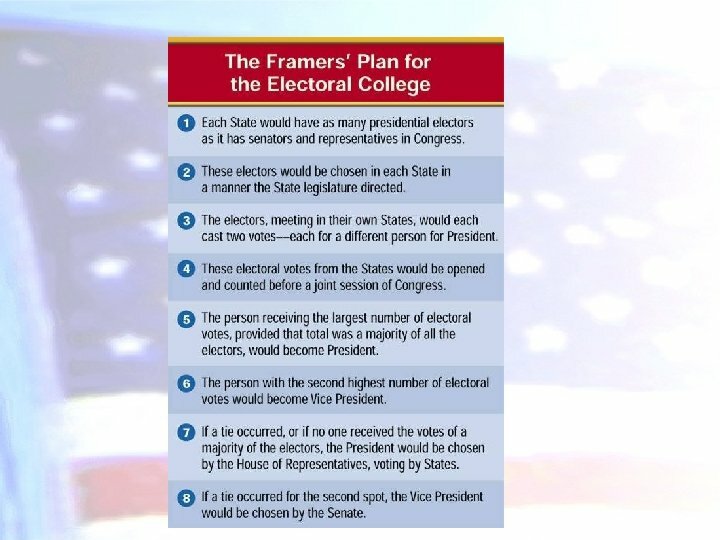 If no candidate gains a majority in the electoral college, the election is thrown into the House, a situation that has happened twice (1800 and 1824). 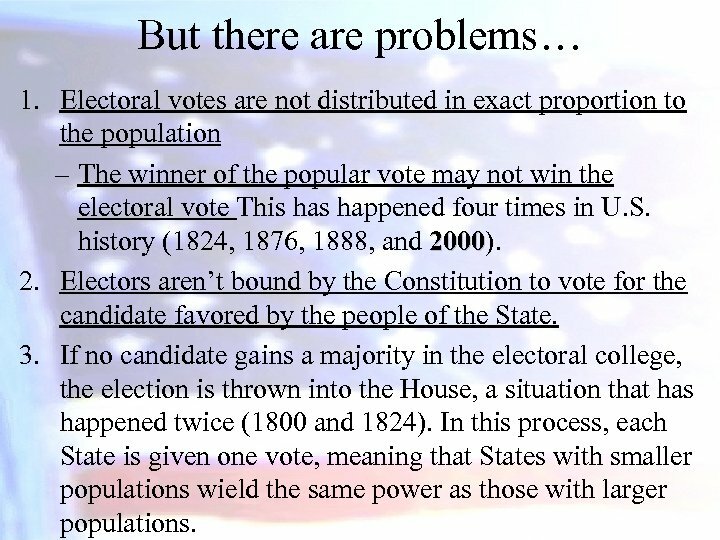 In this process, each State is given one vote, meaning that States with smaller populations wield the same power as those with larger populations. 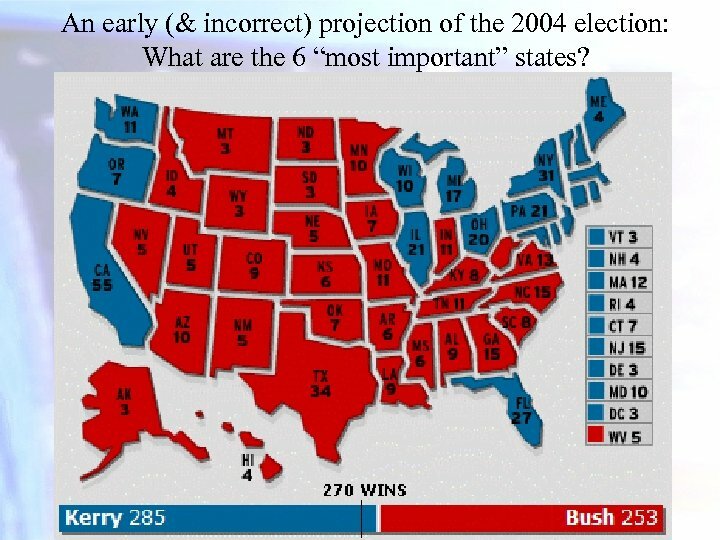 An early (& incorrect) projection of the 2004 election: What are the 6 “most important” states? Nominating the President Today • The 2 major parties have nominated their pres. candidates at National Conventions since 1832. 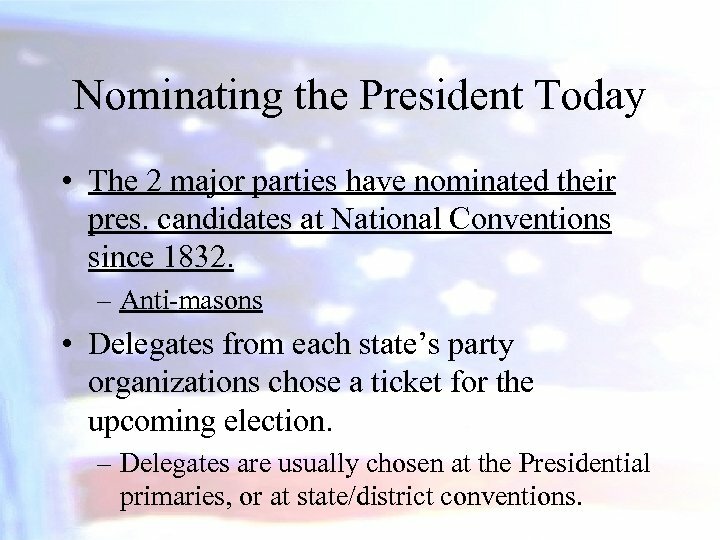 – Anti-masons • Delegates from each state’s party organizations chose a ticket for the upcoming election. – Delegates are usually chosen at the Presidential primaries, or at state/district conventions. 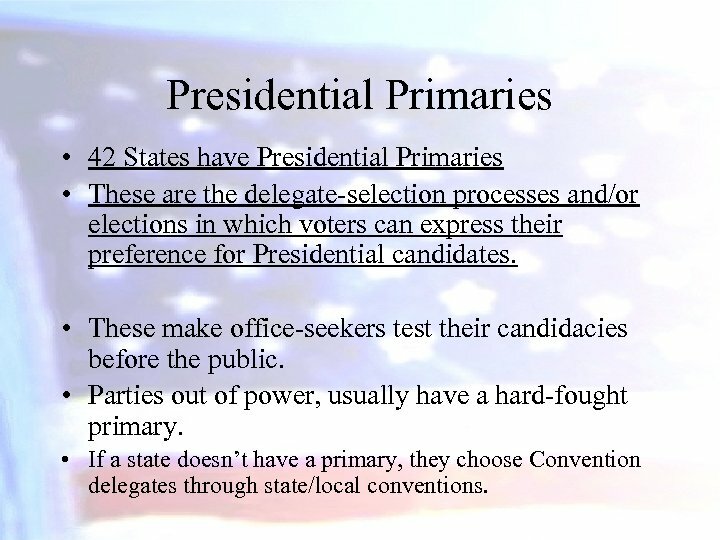 Presidential Primaries • 42 States have Presidential Primaries • These are the delegate-selection processes and/or elections in which voters can express their preference for Presidential candidates. 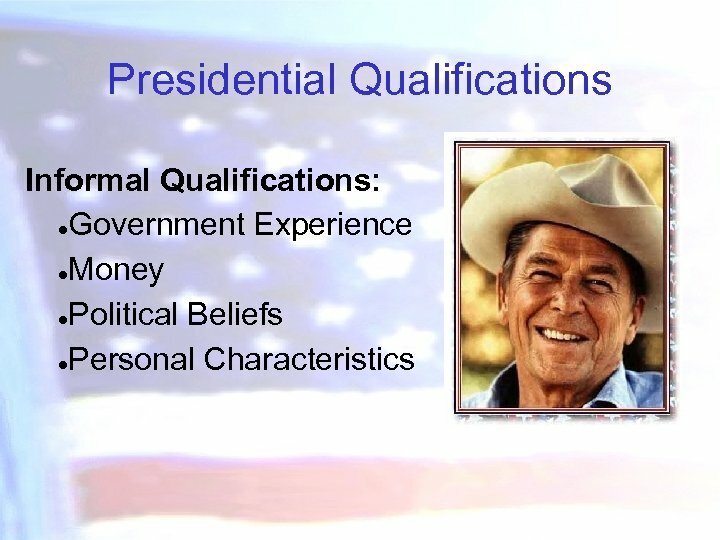 • These make office-seekers test their candidacies before the public. • Parties out of power, usually have a hard-fought primary. 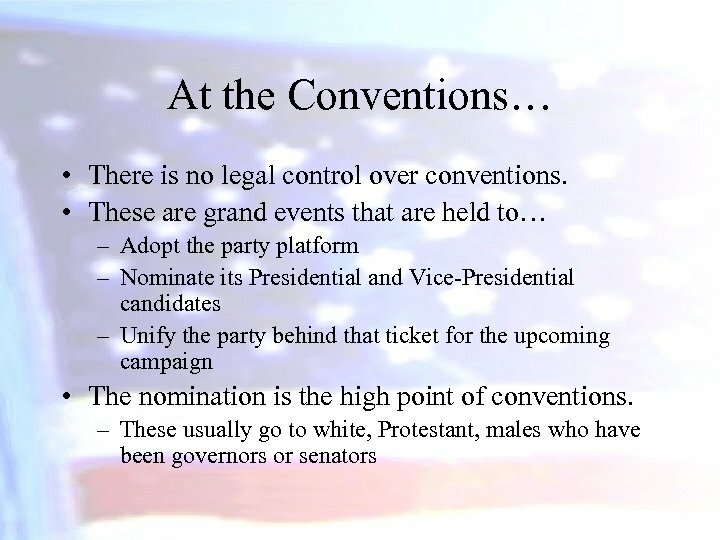 • If a state doesn’t have a primary, they choose Convention delegates through state/local conventions. 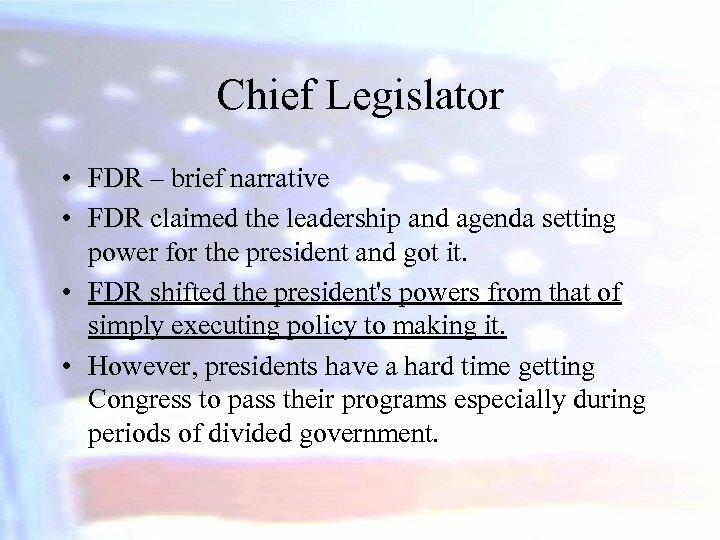 Chief Legislator • FDR – brief narrative • FDR claimed the leadership and agenda setting power for the president and got it. 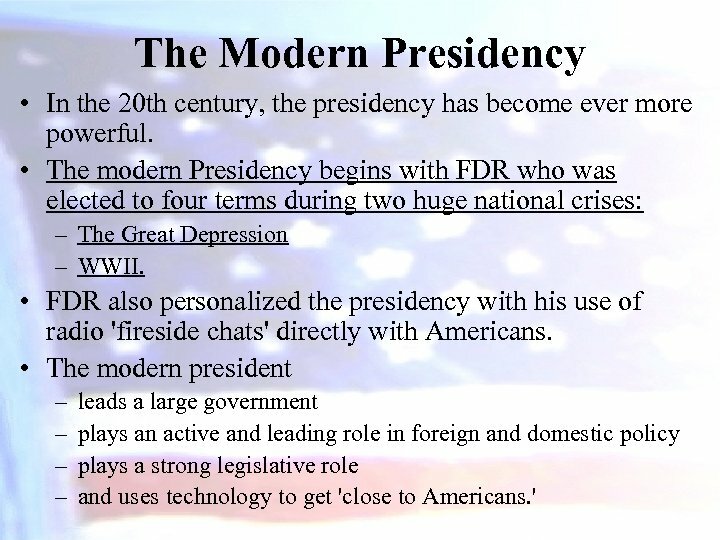 • FDR shifted the president's powers from that of simply executing policy to making it. 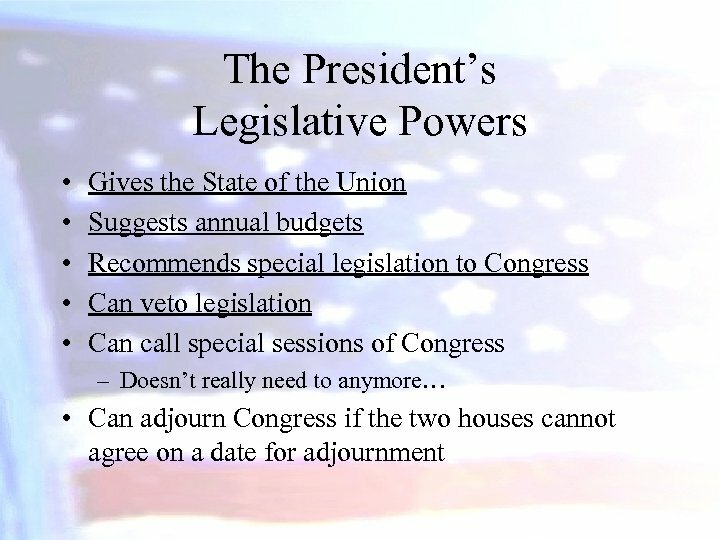 • However, presidents have a hard time getting Congress to pass their programs especially during periods of divided government. 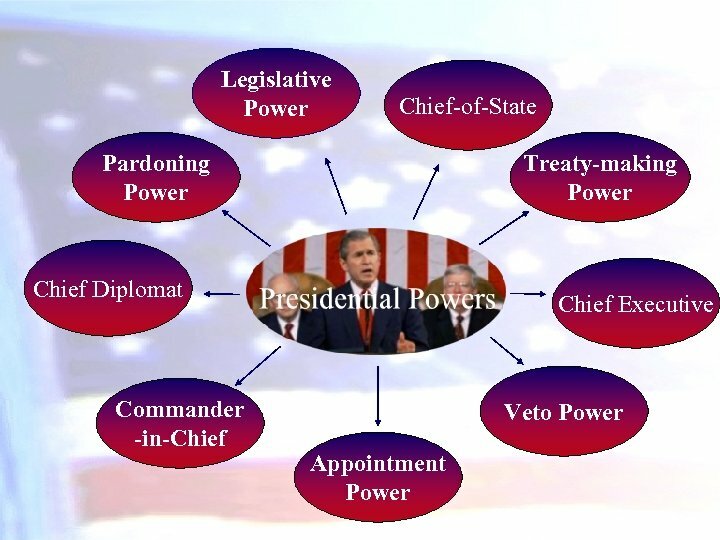 What exactly are the Presidential Powers? 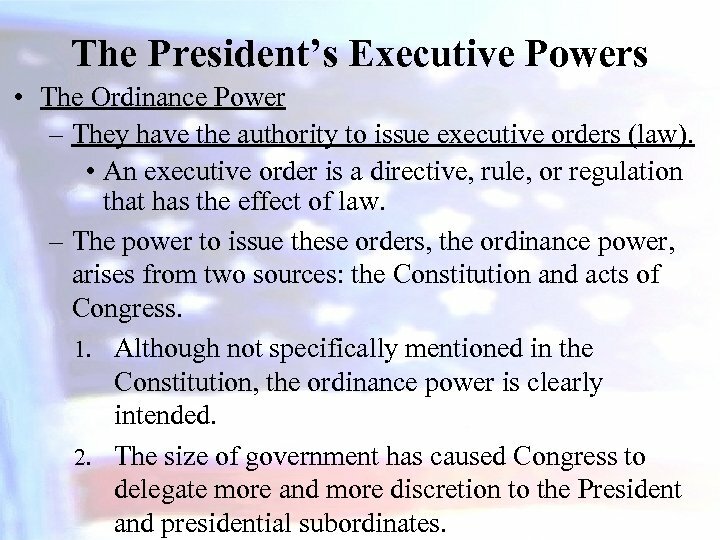 The President’s Executive Powers • The Ordinance Power – They have the authority to issue executive orders (law). 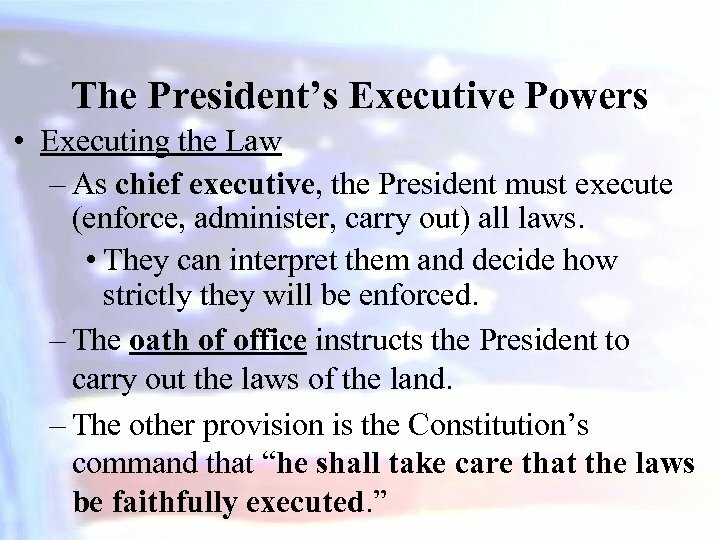 • An executive order is a directive, rule, or regulation that has the effect of law. 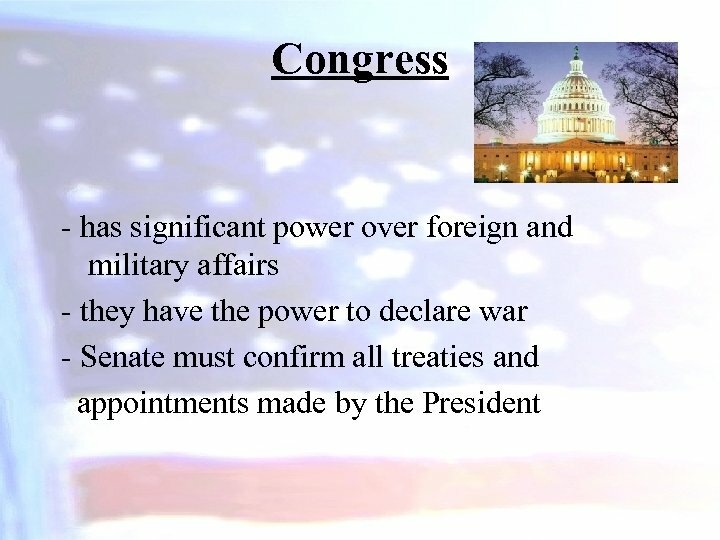 – The power to issue these orders, the ordinance power, arises from two sources: the Constitution and acts of Congress. 1. Although not specifically mentioned in the Constitution, the ordinance power is clearly intended. 2. The size of government has caused Congress to delegate more and more discretion to the President and presidential subordinates. 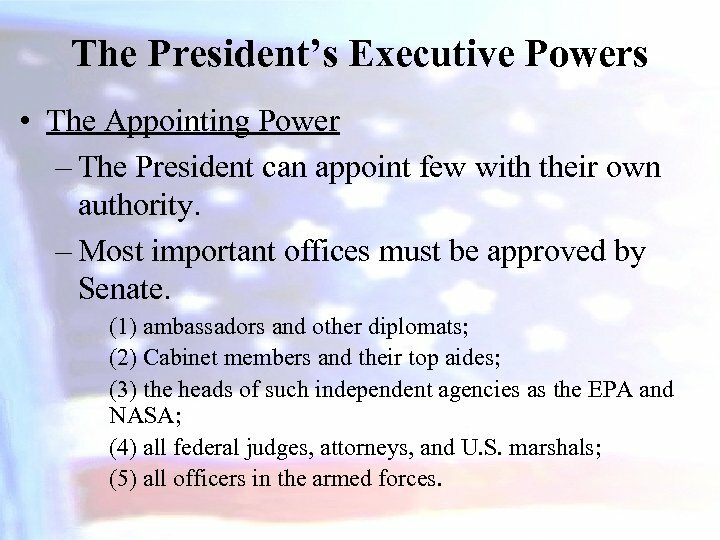 The President’s Executive Powers • The Appointing Power – The President can appoint few with their own authority. – Most important offices must be approved by Senate. 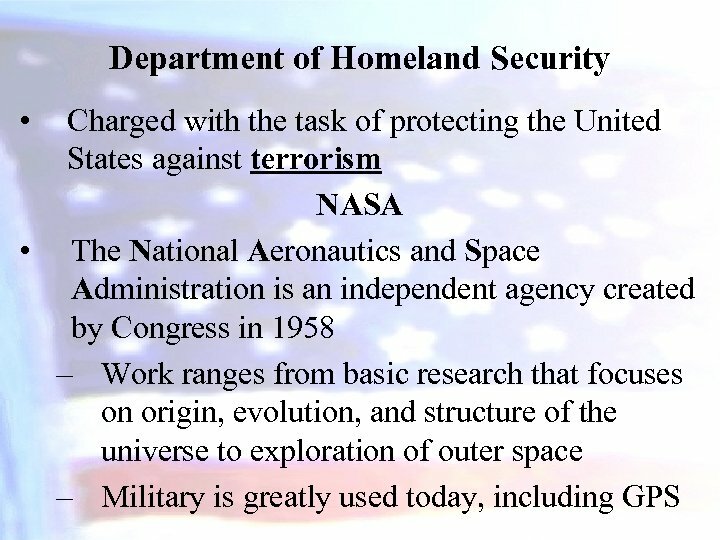 (1) ambassadors and other diplomats; (2) Cabinet members and their top aides; (3) the heads of such independent agencies as the EPA and NASA; (4) all federal judges, attorneys, and U. S. marshals; (5) all officers in the armed forces. 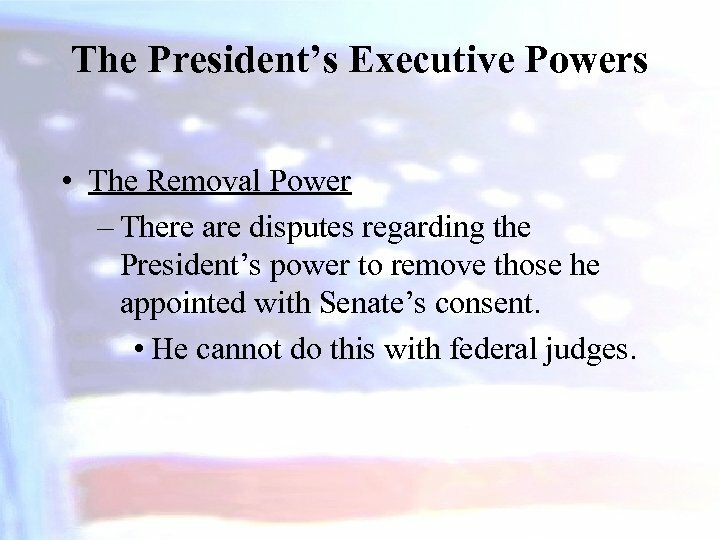 The President’s Executive Powers • The Removal Power – There are disputes regarding the President’s power to remove those he appointed with Senate’s consent. • He cannot do this with federal judges. 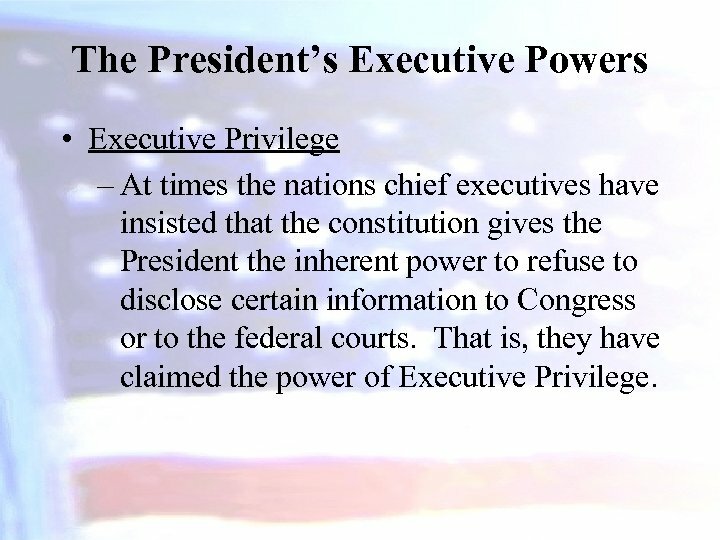 The President’s Executive Powers • Executive Privilege – At times the nations chief executives have insisted that the constitution gives the President the inherent power to refuse to disclose certain information to Congress or to the federal courts. 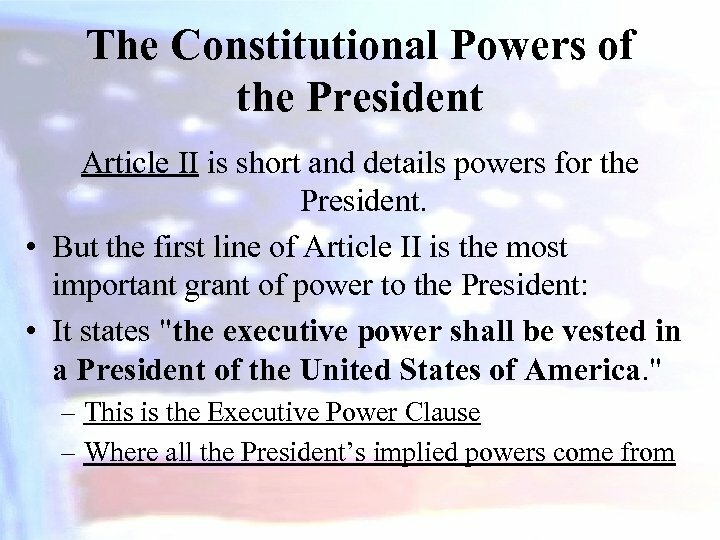 That is, they have claimed the power of Executive Privilege. 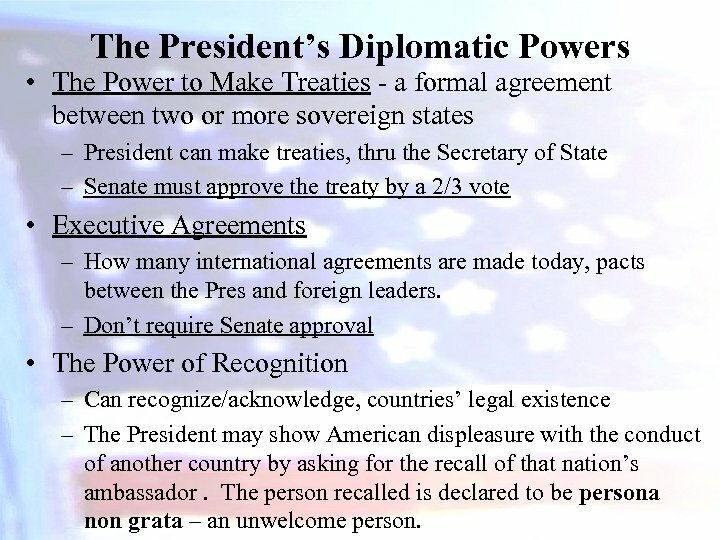 The President’s Diplomatic Powers • The Power to Make Treaties - a formal agreement between two or more sovereign states – President can make treaties, thru the Secretary of State – Senate must approve the treaty by a 2/3 vote • Executive Agreements – How many international agreements are made today, pacts between the Pres and foreign leaders. 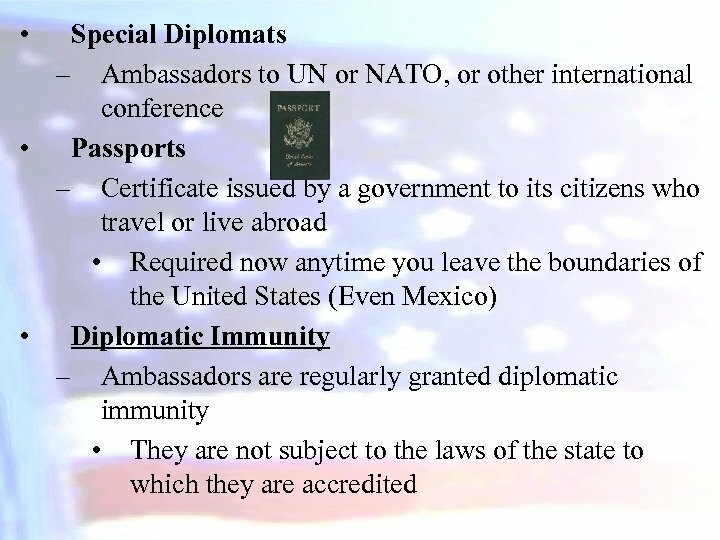 – Don’t require Senate approval • The Power of Recognition – Can recognize/acknowledge, countries’ legal existence – The President may show American displeasure with the conduct of another country by asking for the recall of that nation’s ambassador. The person recalled is declared to be persona non grata – an unwelcome person. 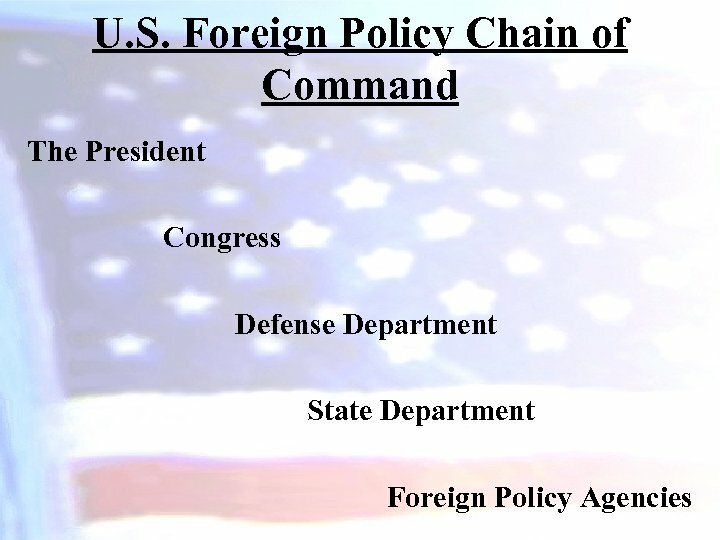 The President & Military Affairs • He shares war powers with Congress, with no limit on their role as commander and chief. 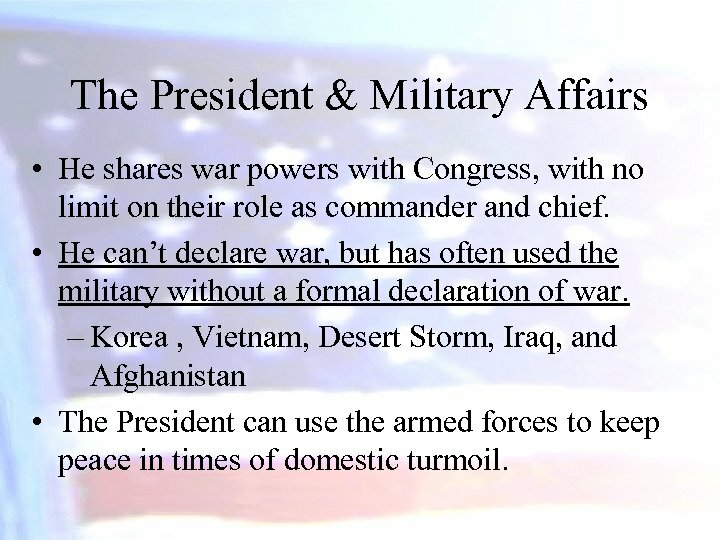 • He can’t declare war, but has often used the military without a formal declaration of war. – Korea , Vietnam, Desert Storm, Iraq, and Afghanistan • The President can use the armed forces to keep peace in times of domestic turmoil. 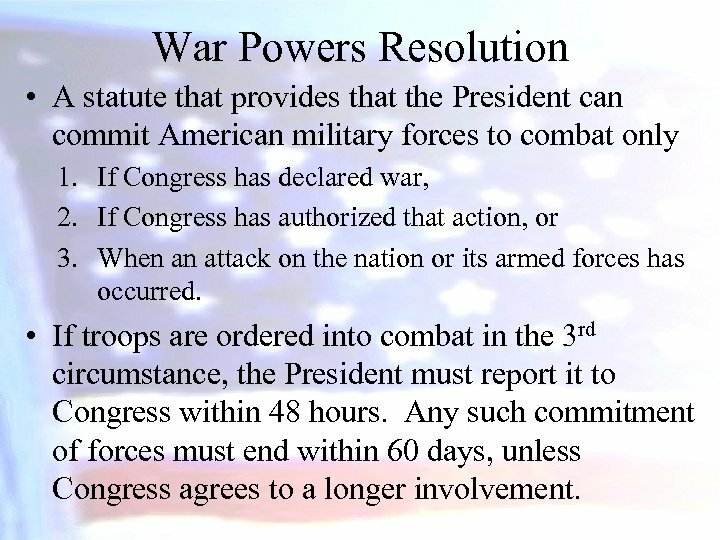 War Powers Resolution • A statute that provides that the President can commit American military forces to combat only 1. If Congress has declared war, 2. 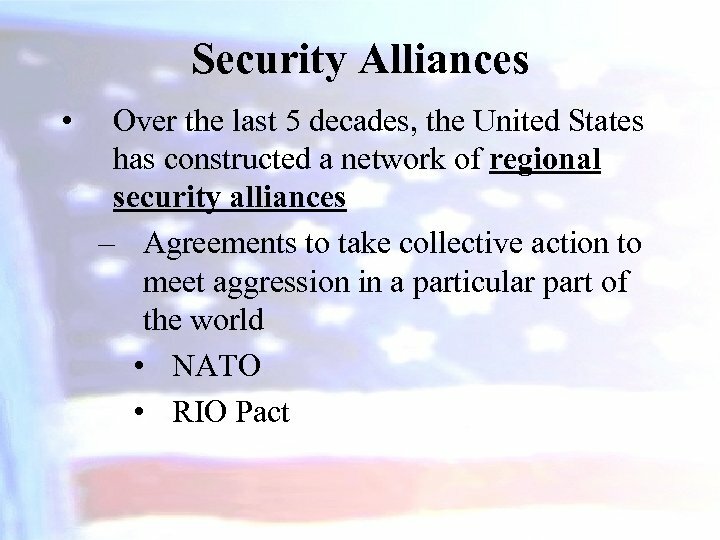 If Congress has authorized that action, or 3. When an attack on the nation or its armed forces has occurred. 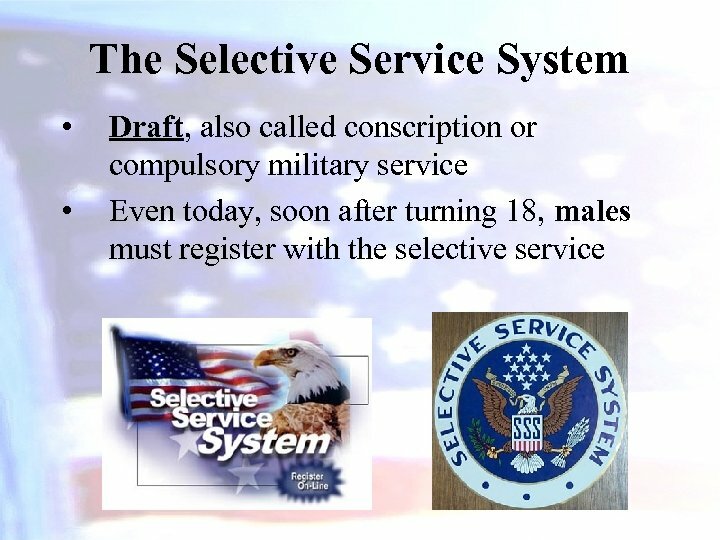 • If troops are ordered into combat in the 3 rd circumstance, the President must report it to Congress within 48 hours. Any such commitment of forces must end within 60 days, unless Congress agrees to a longer involvement. 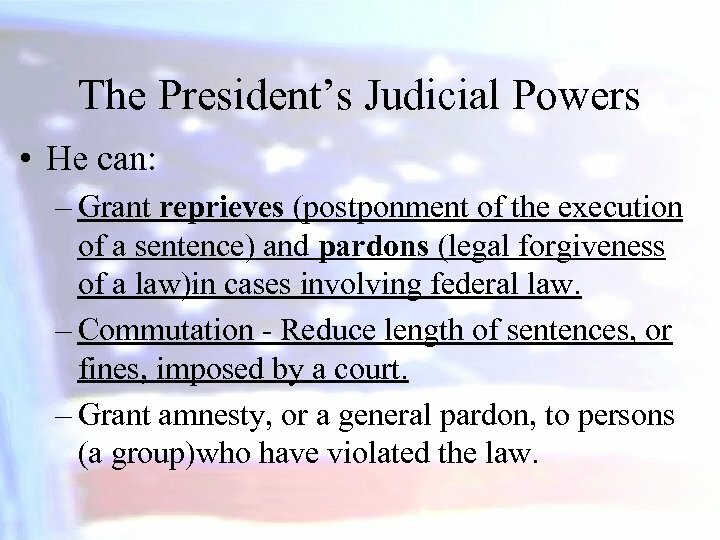 The President’s Judicial Powers • He can: – Grant reprieves (postponment of the execution of a sentence) and pardons (legal forgiveness of a law)in cases involving federal law. – Commutation - Reduce length of sentences, or fines, imposed by a court. – Grant amnesty, or a general pardon, to persons (a group)who have violated the law. 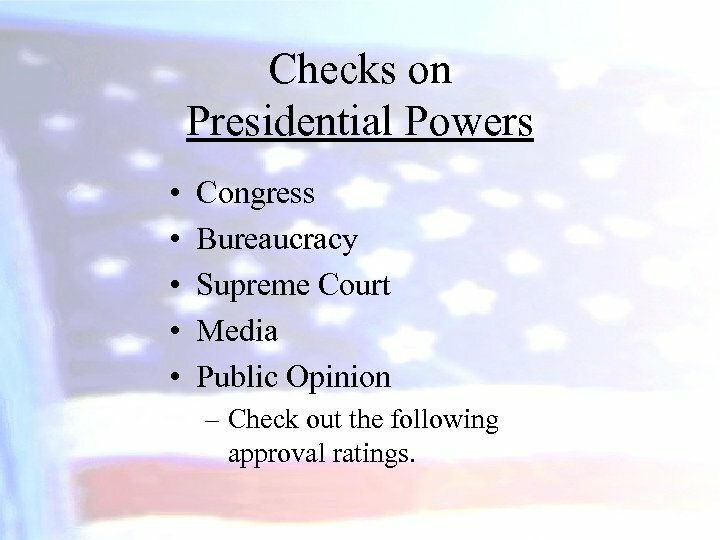 Checks on Presidential Powers • • • Congress Bureaucracy Supreme Court Media Public Opinion – Check out the following approval ratings. 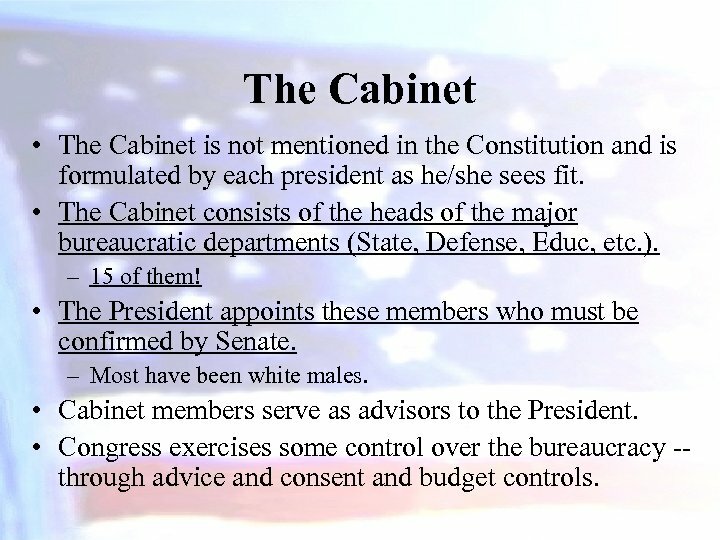 The Cabinet • The Cabinet is not mentioned in the Constitution and is formulated by each president as he/she sees fit. 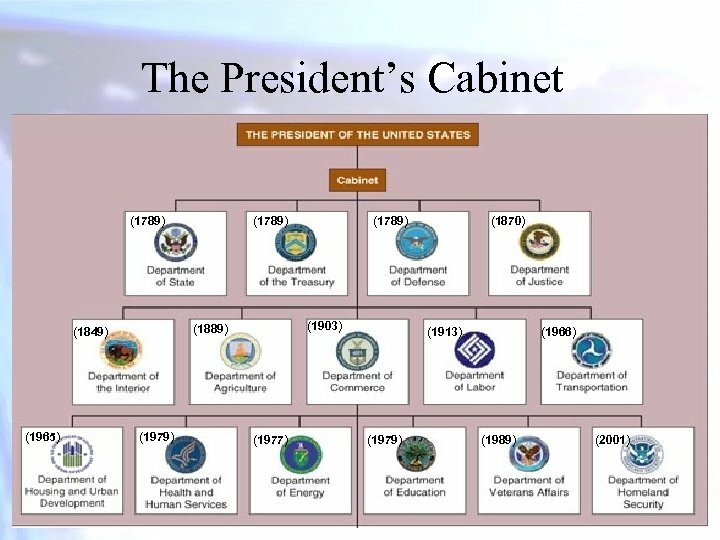 • The Cabinet consists of the heads of the major bureaucratic departments (State, Defense, Educ, etc. ). – 15 of them! • The President appoints these members who must be confirmed by Senate. – Most have been white males. 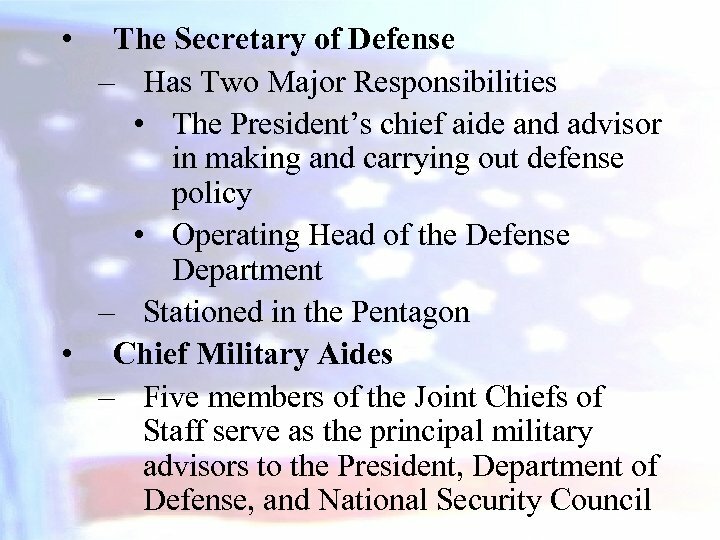 • Cabinet members serve as advisors to the President. 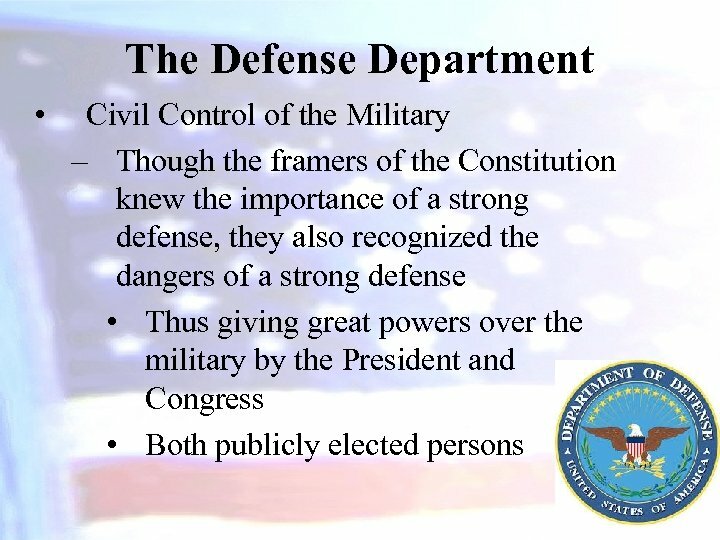 • Congress exercises some control over the bureaucracy -- through advice and consent and budget controls. 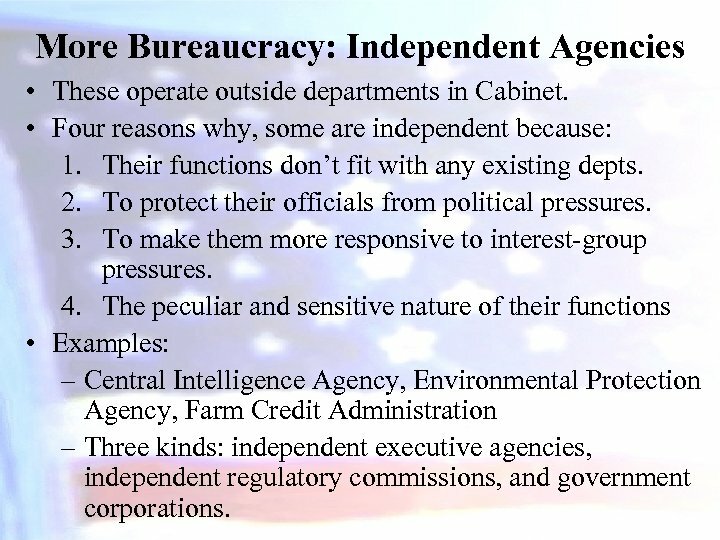 More Bureaucracy: Independent Agencies • These operate outside departments in Cabinet. • Four reasons why, some are independent because: 1. 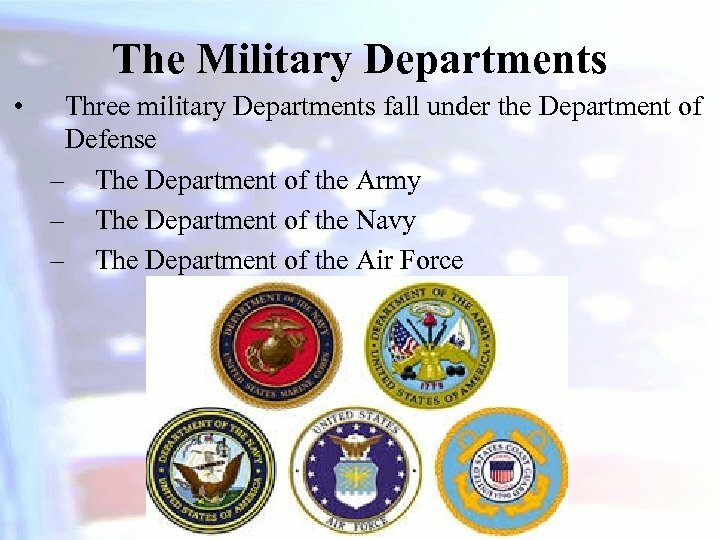 Their functions don’t fit with any existing depts. 2. To protect their officials from political pressures. 3. To make them more responsive to interest-group pressures. 4. 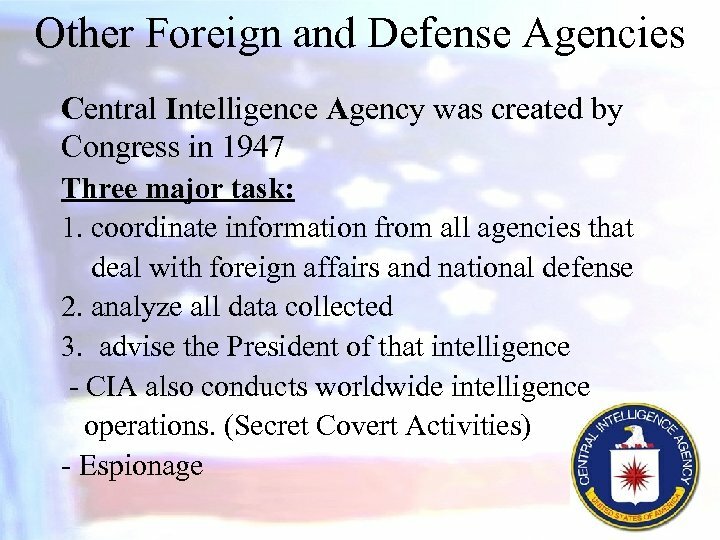 The peculiar and sensitive nature of their functions • Examples: – Central Intelligence Agency, Environmental Protection Agency, Farm Credit Administration – Three kinds: independent executive agencies, independent regulatory commissions, and government corporations. 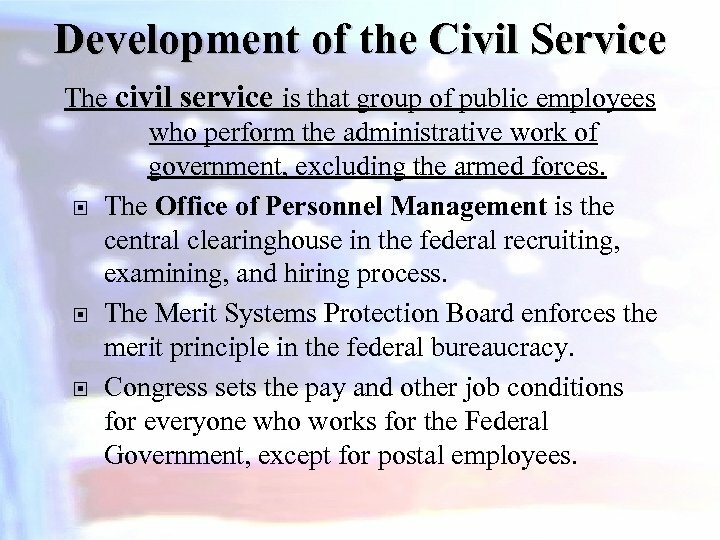 Development of the Civil Service The civil service is that group of public employees who perform the administrative work of government, excluding the armed forces. The Office of Personnel Management is the central clearinghouse in the federal recruiting, examining, and hiring process. 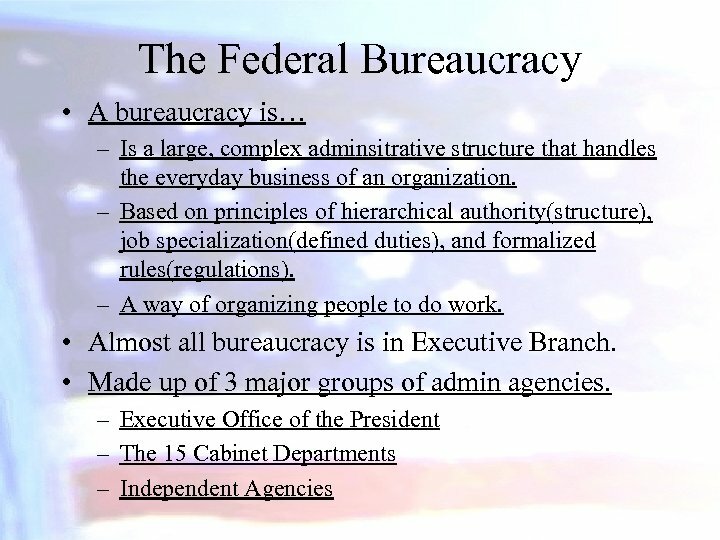 The Merit Systems Protection Board enforces the merit principle in the federal bureaucracy. Congress sets the pay and other job conditions for everyone who works for the Federal Government, except for postal employees. 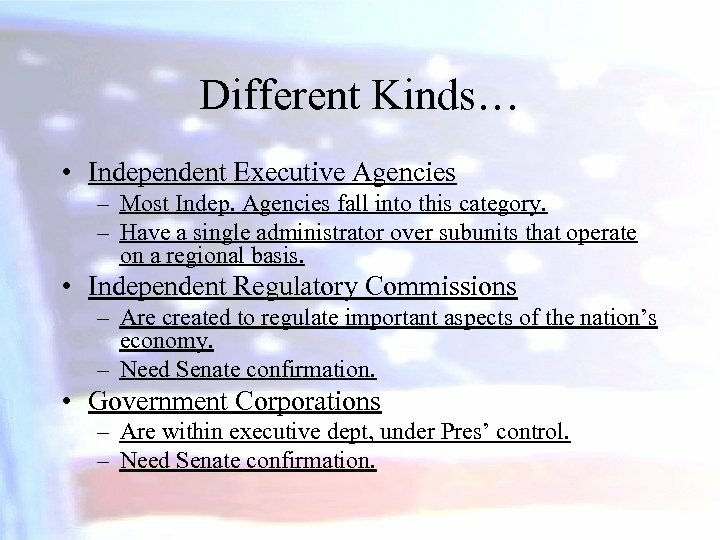 Different Kinds… • Independent Executive Agencies – Most Indep. Agencies fall into this category. – Have a single administrator over subunits that operate on a regional basis. • Independent Regulatory Commissions – Are created to regulate important aspects of the nation’s economy. – Need Senate confirmation. 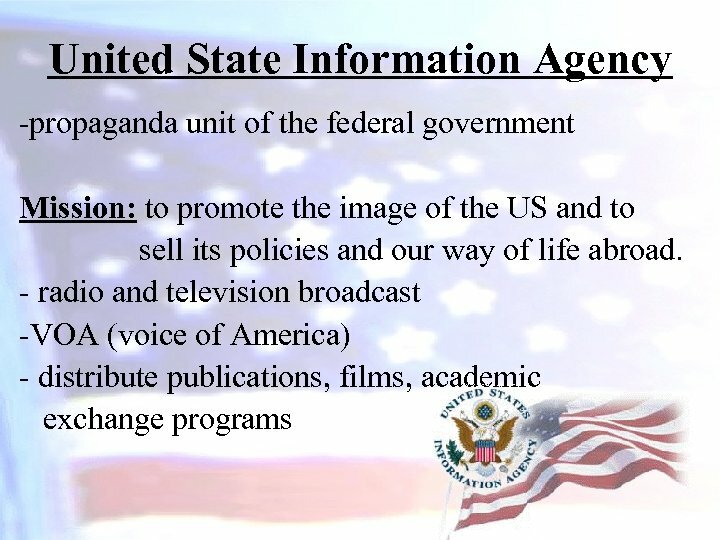 • Government Corporations – Are within executive dept, under Pres’ control. – Need Senate confirmation. 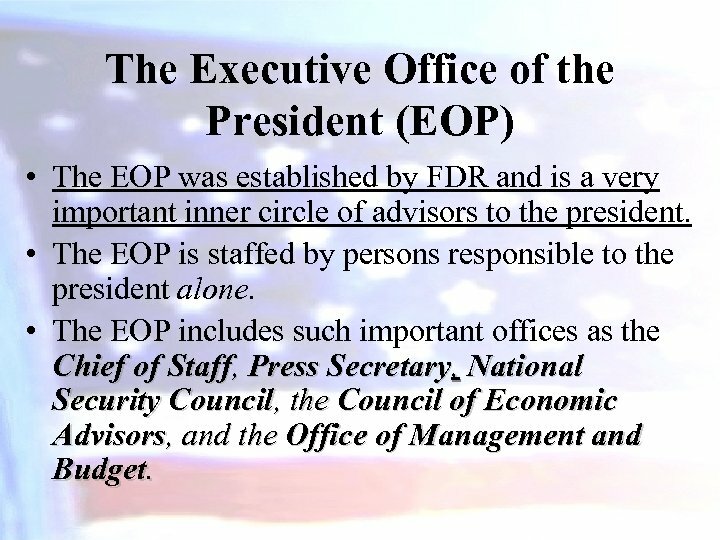 The Executive Office of the President (EOP) • The EOP was established by FDR and is a very important inner circle of advisors to the president. 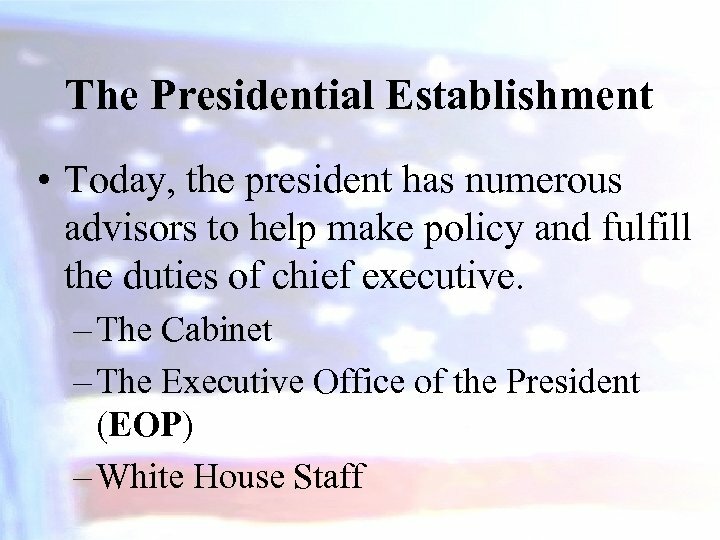 • The EOP is staffed by persons responsible to the president alone. 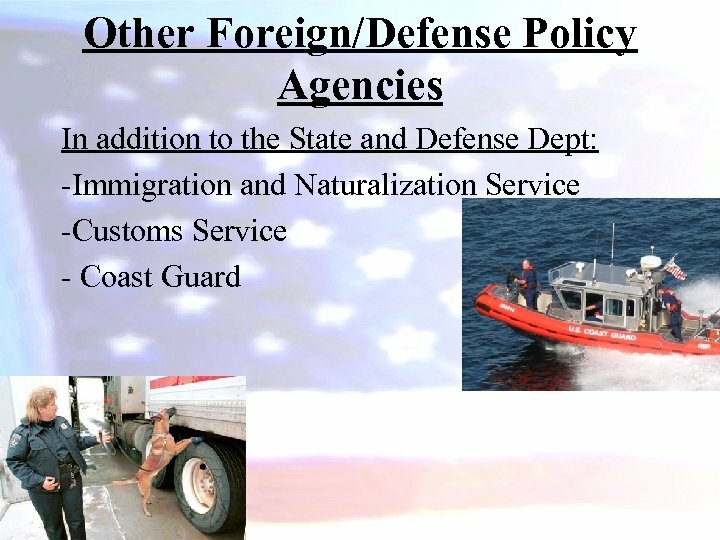 • The EOP includes such important offices as the Chief of Staff, Press Secretary, National Security Council, the Council of Economic Advisors, and the Office of Management and Budget. 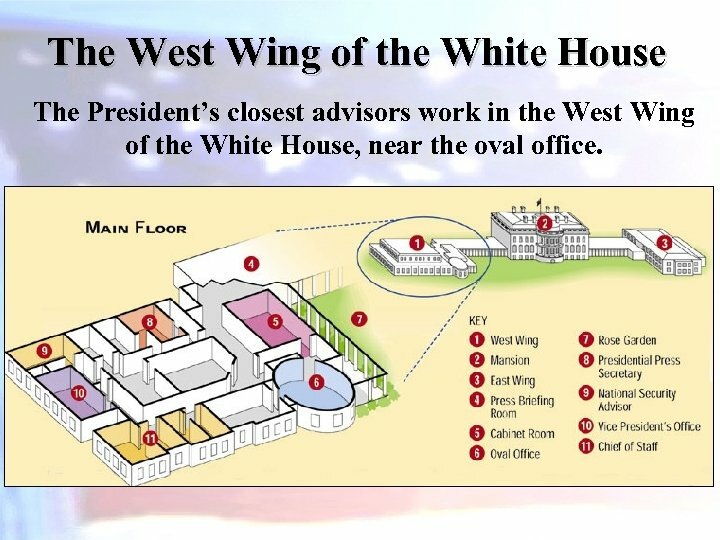 The West Wing of the White House The President’s closest advisors work in the West Wing of the White House, near the oval office. 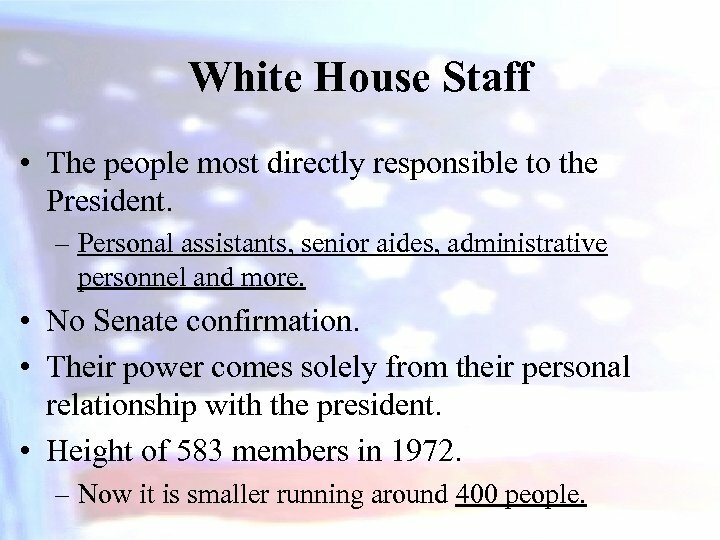 White House Staff • The people most directly responsible to the President. – Personal assistants, senior aides, administrative personnel and more. • No Senate confirmation. • Their power comes solely from their personal relationship with the president. • Height of 583 members in 1972. – Now it is smaller running around 400 people. 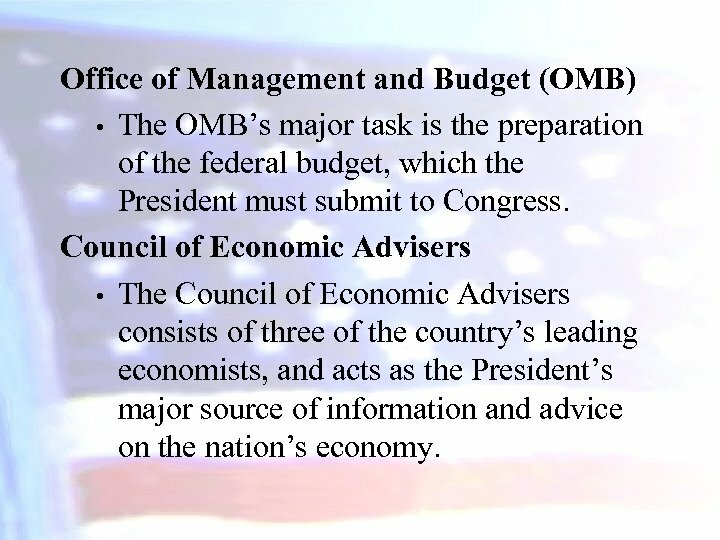 Office of Management and Budget (OMB) • The OMB’s major task is the preparation of the federal budget, which the President must submit to Congress. Council of Economic Advisers • The Council of Economic Advisers consists of three of the country’s leading economists, and acts as the President’s major source of information and advice on the nation’s economy. 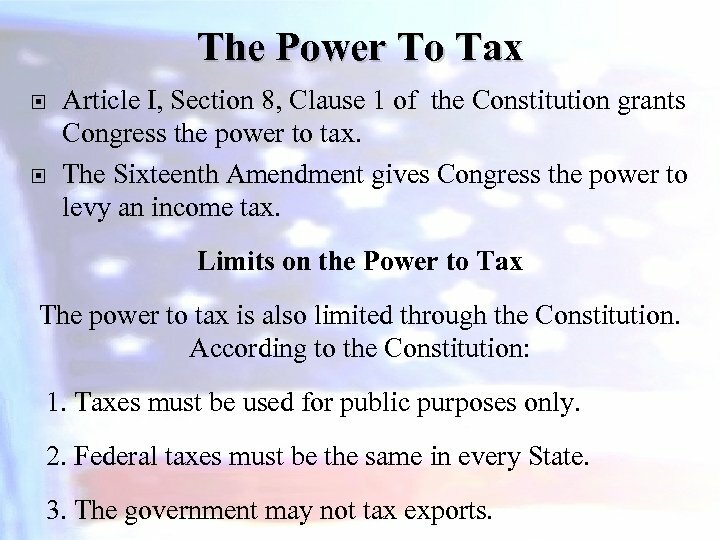 The Power To Tax Article I, Section 8, Clause 1 of the Constitution grants Congress the power to tax. The Sixteenth Amendment gives Congress the power to levy an income tax. Limits on the Power to Tax The power to tax is also limited through the Constitution. According to the Constitution: 1. Taxes must be used for public purposes only. 2. Federal taxes must be the same in every State. 3. The government may not tax exports. 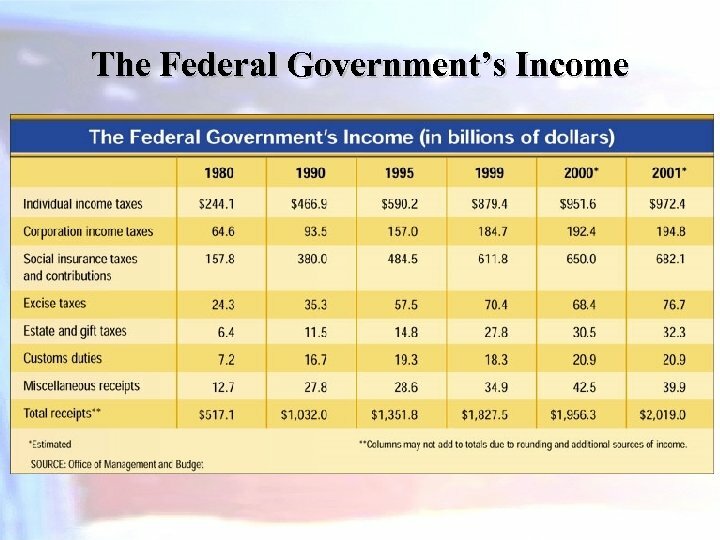 The income tax is the largest source of federal revenue today. 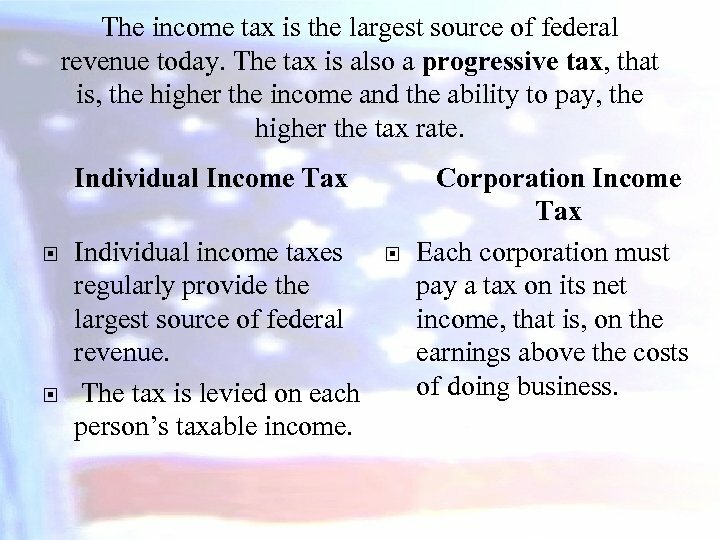 The tax is also a progressive tax, that is, the higher the income and the ability to pay, the higher the tax rate. Individual Income Tax Individual income taxes regularly provide the largest source of federal revenue. The tax is levied on each person’s taxable income. Corporation Income Tax Each corporation must pay a tax on its net income, that is, on the earnings above the costs of doing business. 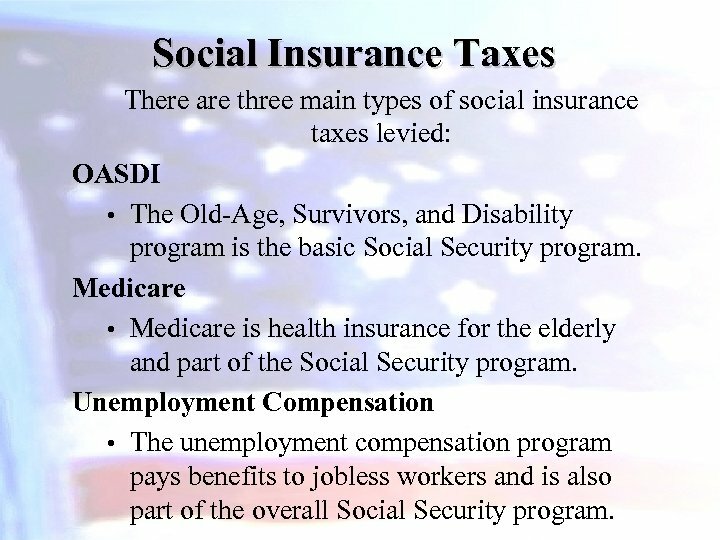 Social Insurance Taxes There are three main types of social insurance taxes levied: OASDI • The Old-Age, Survivors, and Disability program is the basic Social Security program. Medicare • Medicare is health insurance for the elderly and part of the Social Security program. Unemployment Compensation • The unemployment compensation program pays benefits to jobless workers and is also part of the overall Social Security program. Other Types of Taxes Excise Taxes • An excise tax is a tax laid on the manufacture, sale, or consumption of goods and/or the performance of services. Custom Duties • A custom duty is a tax laid on goods brought into the U. S. from abroad. Estate and Gift Taxes • An estate tax is a levy imposed on the assets (estate) of one who dies. 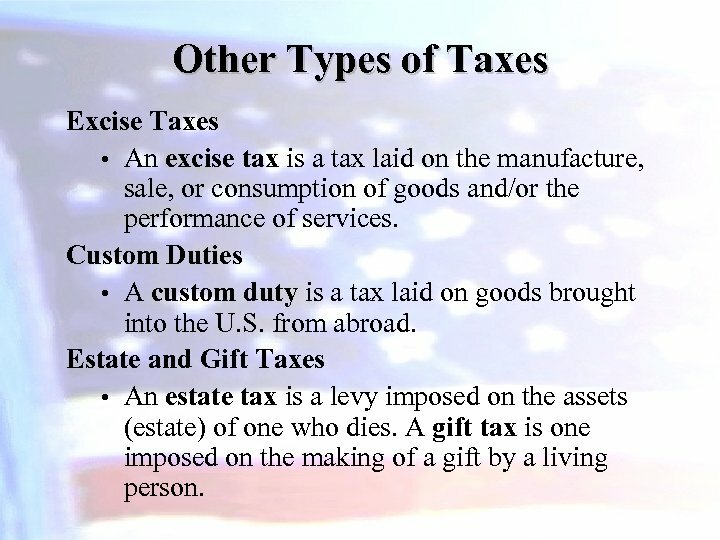 A gift tax is one imposed on the making of a gift by a living person. Taxing for Nonrevenue Purposes Besides taxing for revenue purposes, the Federal Government sometimes taxes for the purpose of regulating and even discouraging some activity that Congress thinks is harmful or dangerous to the public. 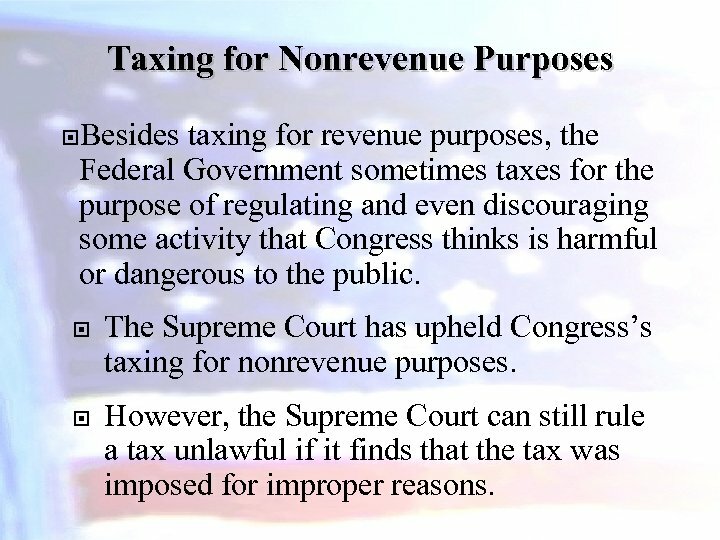 The Supreme Court has upheld Congress’s taxing for nonrevenue purposes. However, the Supreme Court can still rule a tax unlawful if it finds that the tax was imposed for improper reasons. 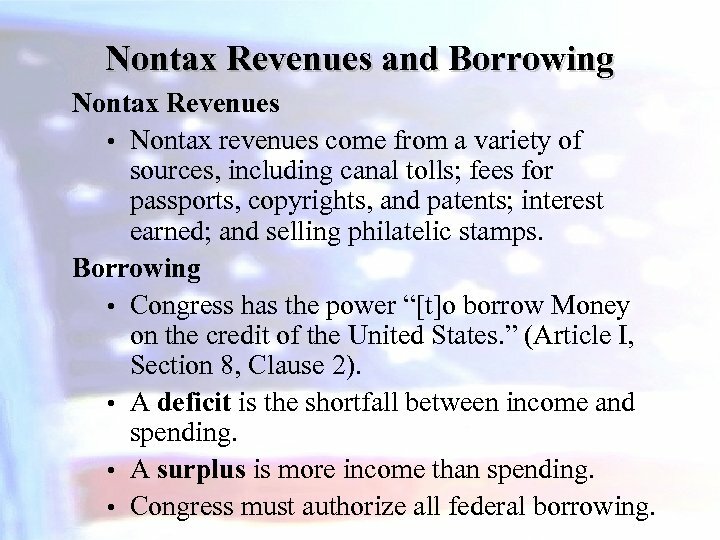 Nontax Revenues and Borrowing Nontax Revenues • Nontax revenues come from a variety of sources, including canal tolls; fees for passports, copyrights, and patents; interest earned; and selling philatelic stamps. Borrowing • Congress has the power “[t]o borrow Money on the credit of the United States. ” (Article I, Section 8, Clause 2). 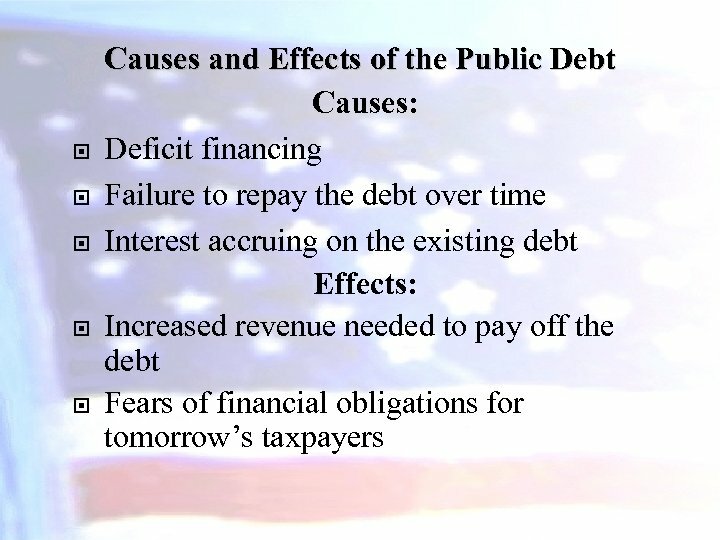 • A deficit is the shortfall between income and spending. • A surplus is more income than spending. • Congress must authorize all federal borrowing. 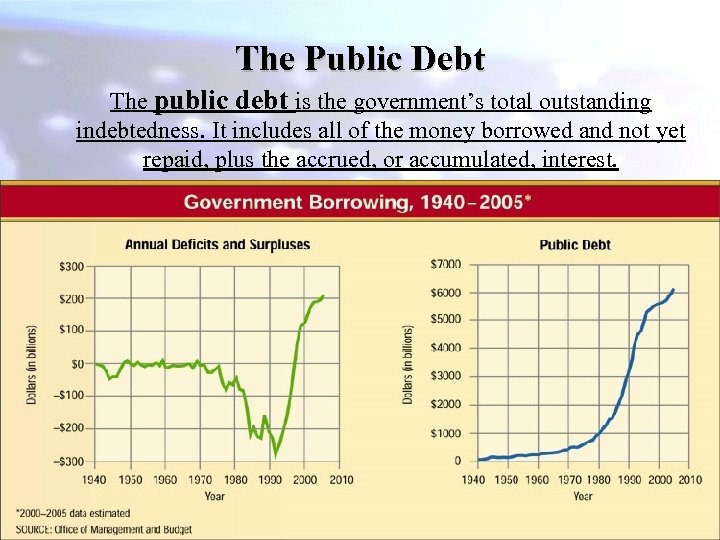 The Public Debt The public debt is the government’s total outstanding indebtedness. It includes all of the money borrowed and not yet repaid, plus the accrued, or accumulated, interest. 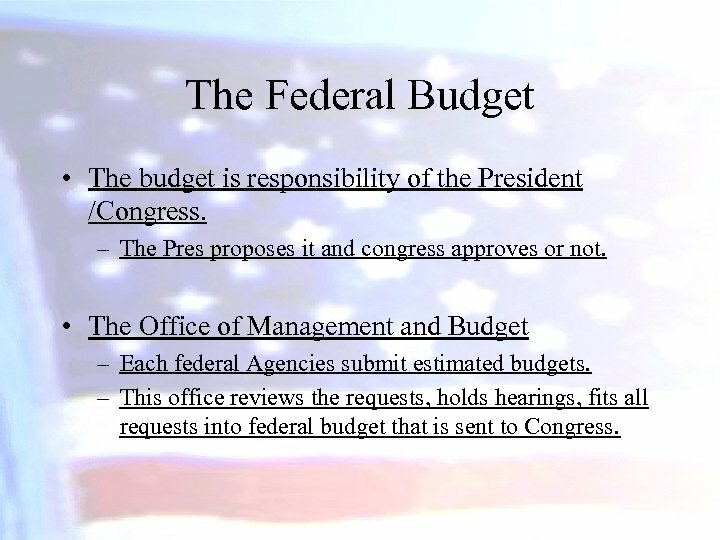 The Federal Budget • The budget is responsibility of the President /Congress. – The Pres proposes it and congress approves or not. 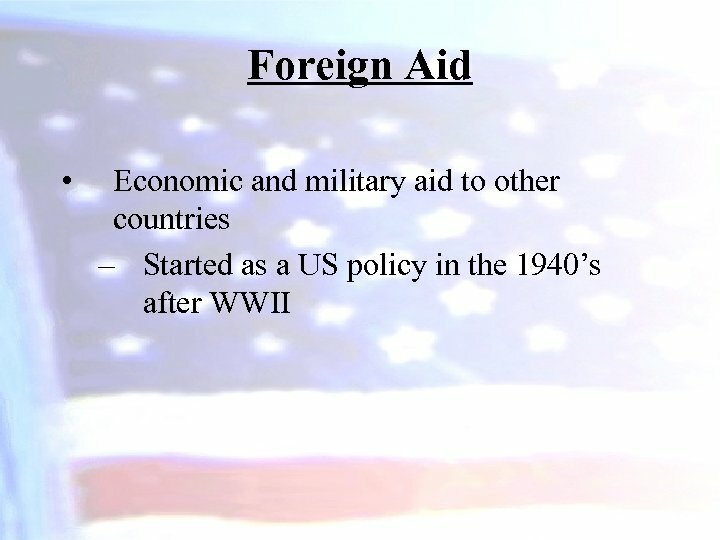 • The Office of Management and Budget – Each federal Agencies submit estimated budgets. – This office reviews the requests, holds hearings, fits all requests into federal budget that is sent to Congress. 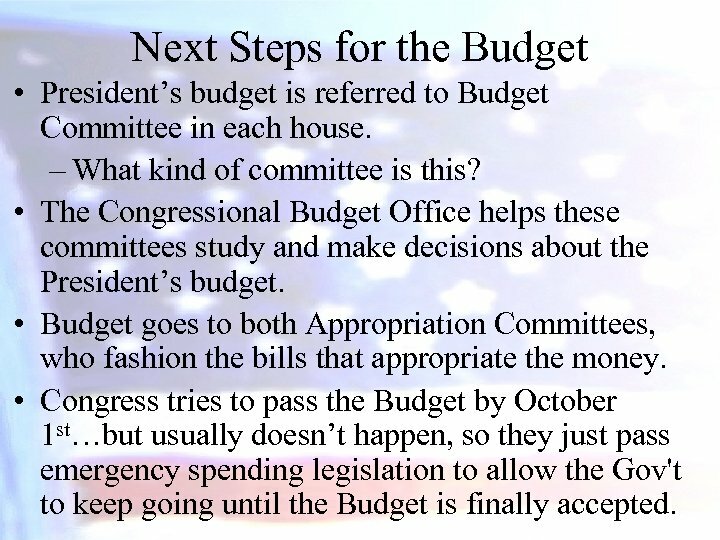 Next Steps for the Budget • President’s budget is referred to Budget Committee in each house. – What kind of committee is this? 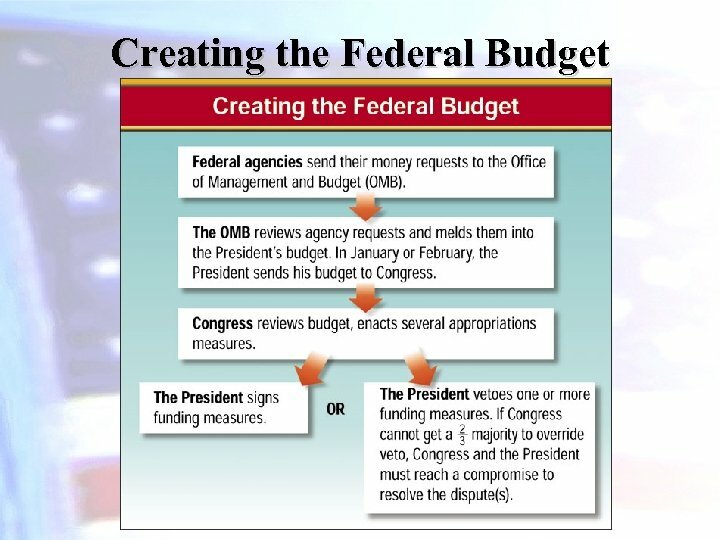 • The Congressional Budget Office helps these committees study and make decisions about the President’s budget. • Budget goes to both Appropriation Committees, who fashion the bills that appropriate the money. 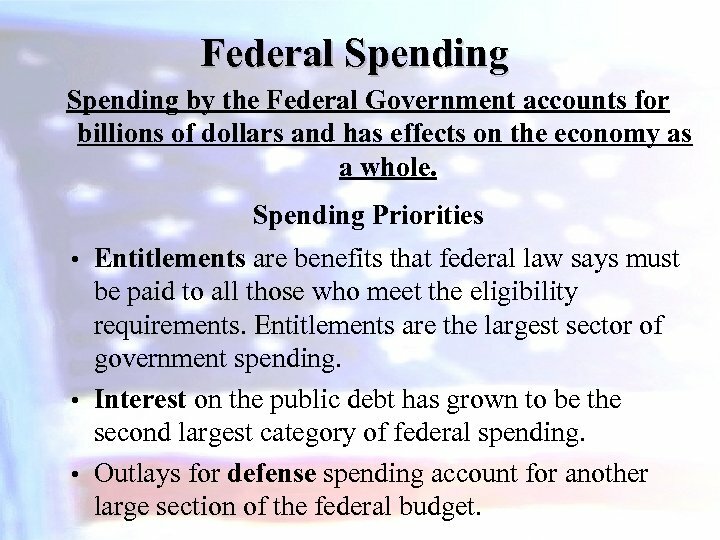 • Congress tries to pass the Budget by October 1 st…but usually doesn’t happen, so they just pass emergency spending legislation to allow the Gov't to keep going until the Budget is finally accepted. 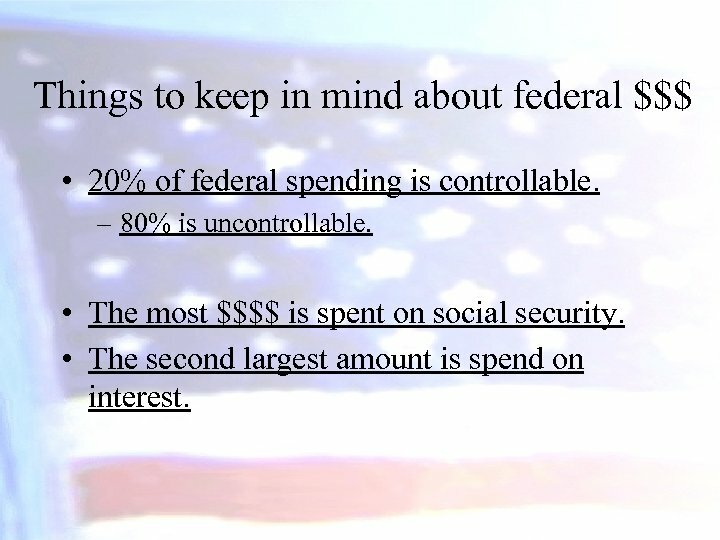 Things to keep in mind about federal $$$ • 20% of federal spending is controllable. – 80% is uncontrollable. • The most $$$$ is spent on social security. • The second largest amount is spend on interest. 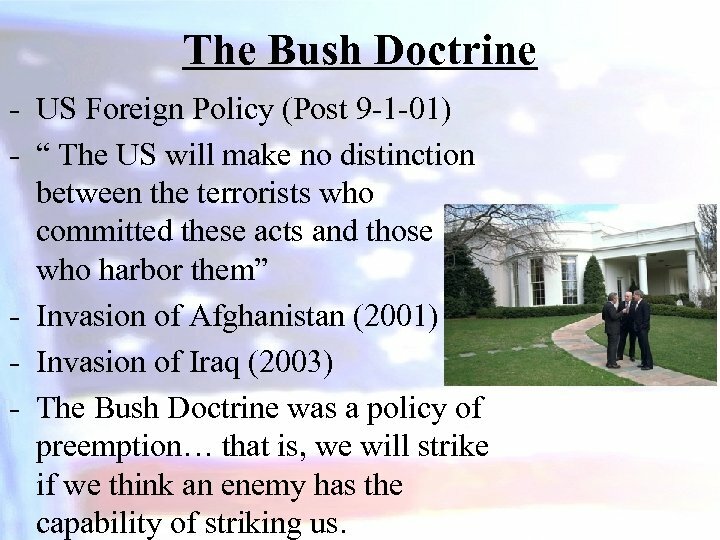 The Bush Doctrine - US Foreign Policy (Post 9 -1 -01) - “ The US will make no distinction between the terrorists who committed these acts and those who harbor them” - Invasion of Afghanistan (2001) - Invasion of Iraq (2003) - The Bush Doctrine was a policy of preemption… that is, we will strike if we think an enemy has the capability of striking us.